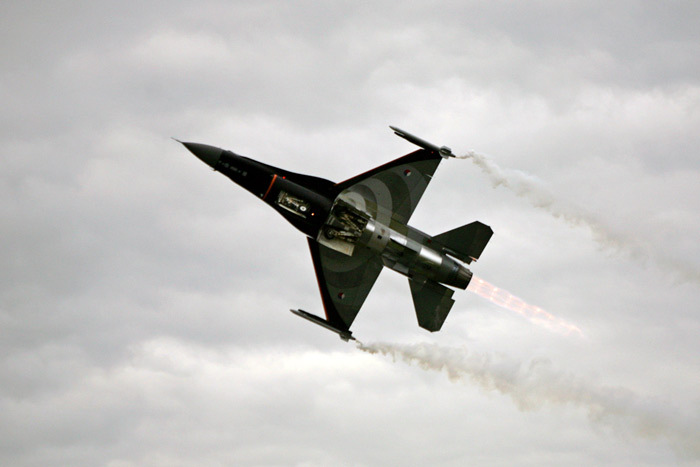 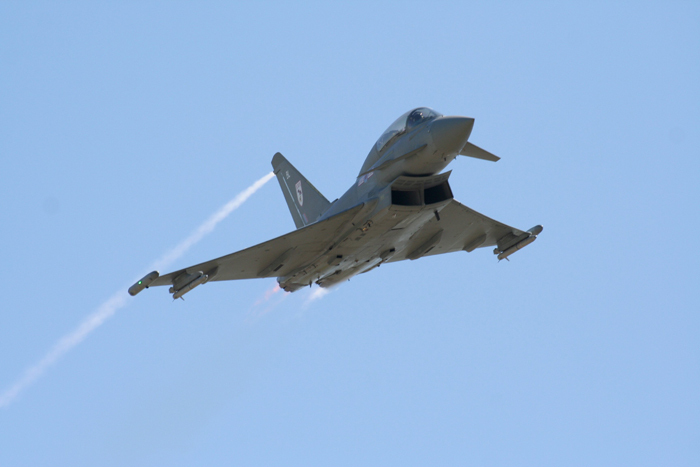 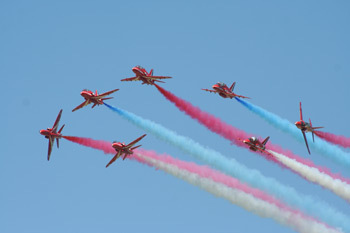 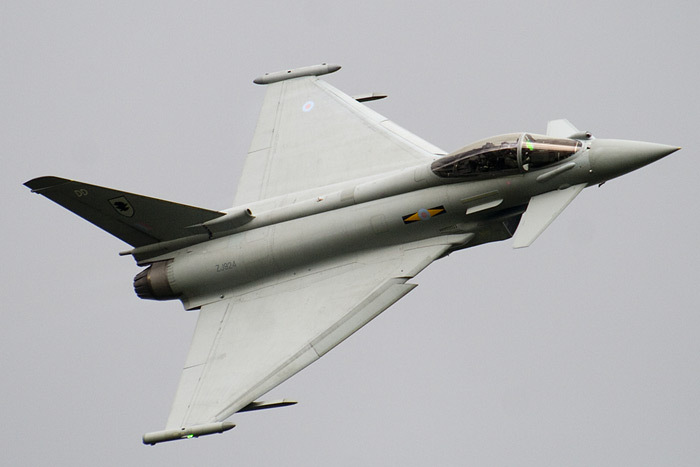 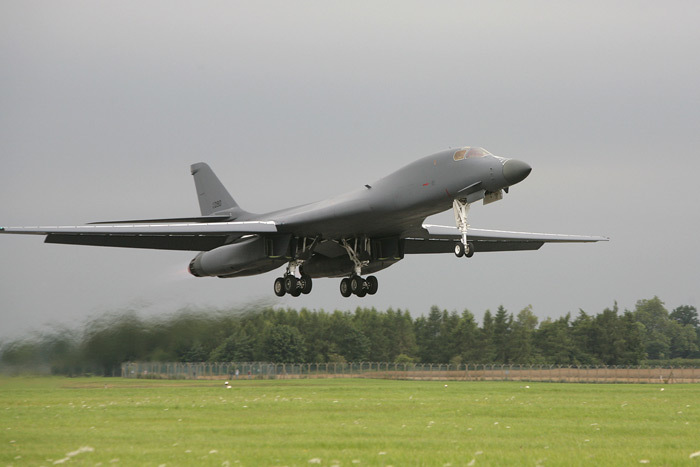 The Royal International Air Tattoo is held annually in July at RAF Fairford in Gloucestershire. 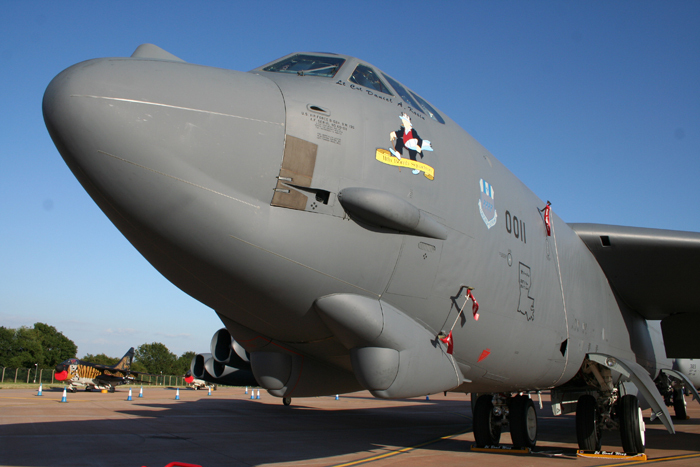 With over 300 aircraft from around the world and over 150,000 visitors over the weekend it makes Fairford the biggest air show in the world. 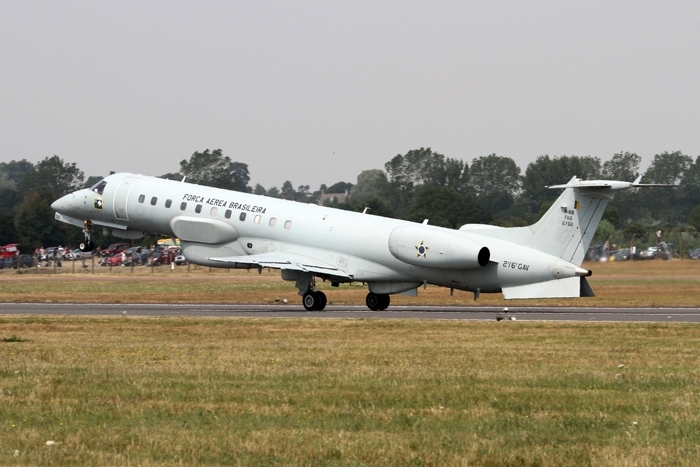 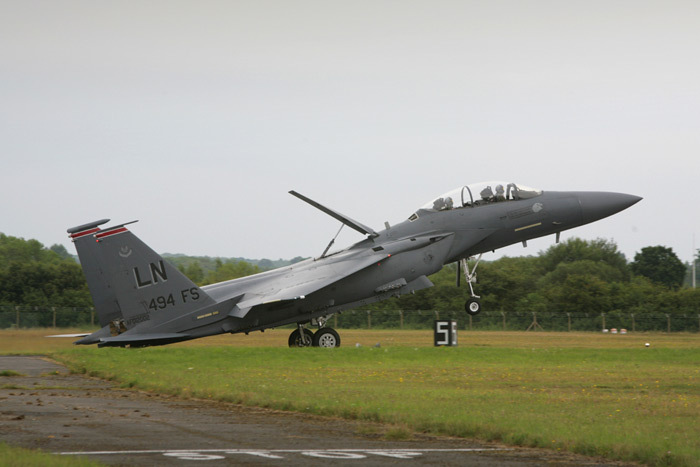 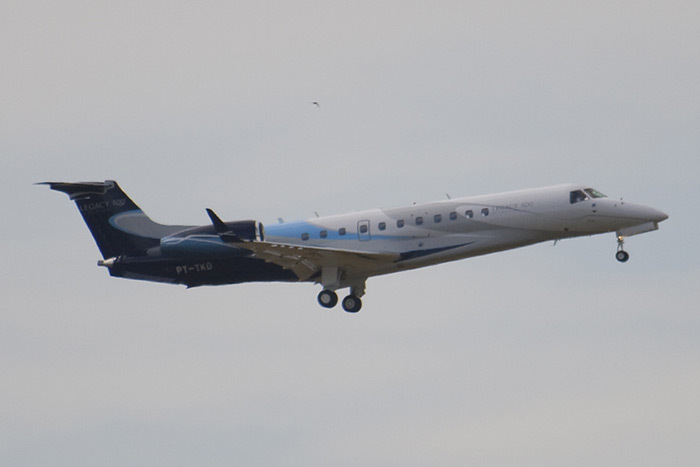 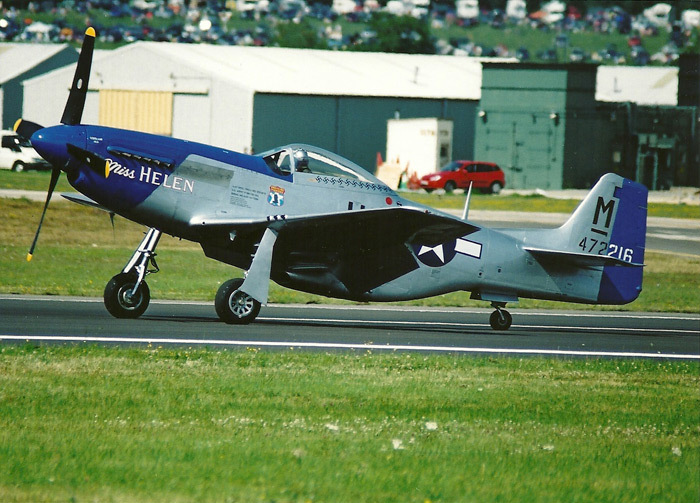 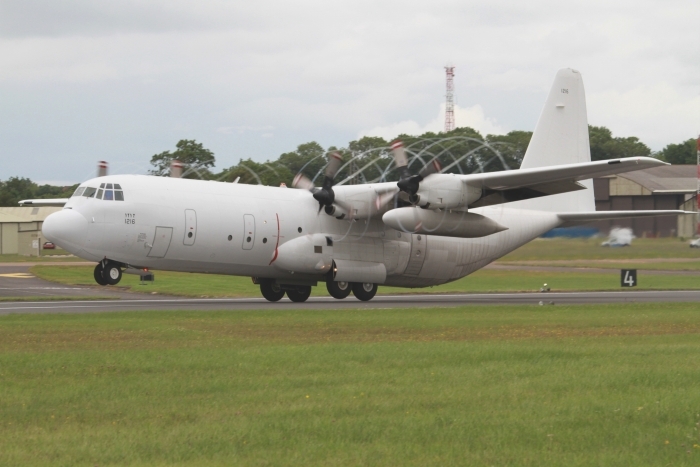 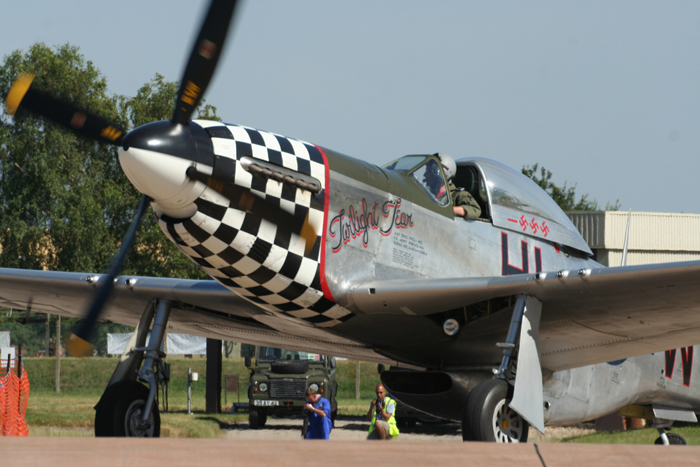 Starting with arrivals day on Friday until departures day on the Monday, Fairford Air Show is a haven for photographers, aviation enthusiasts and the general public alike. 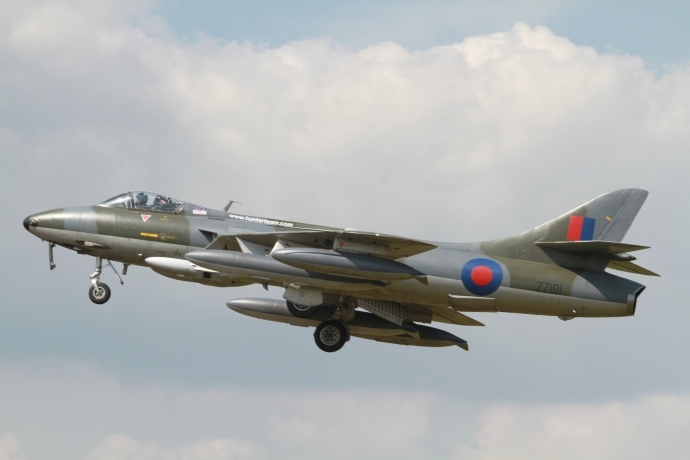 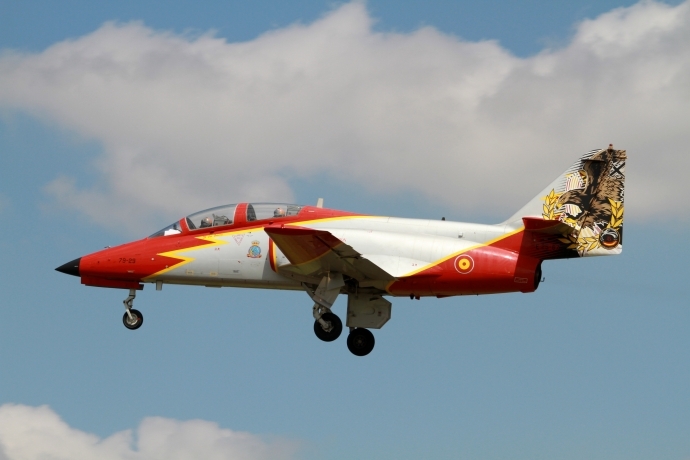 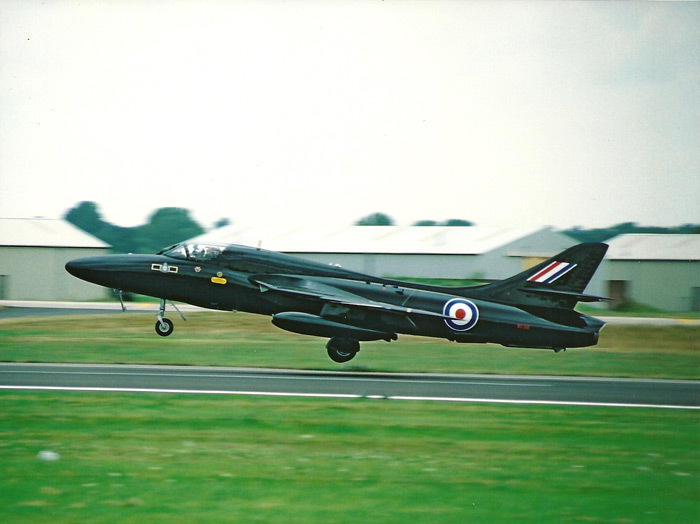 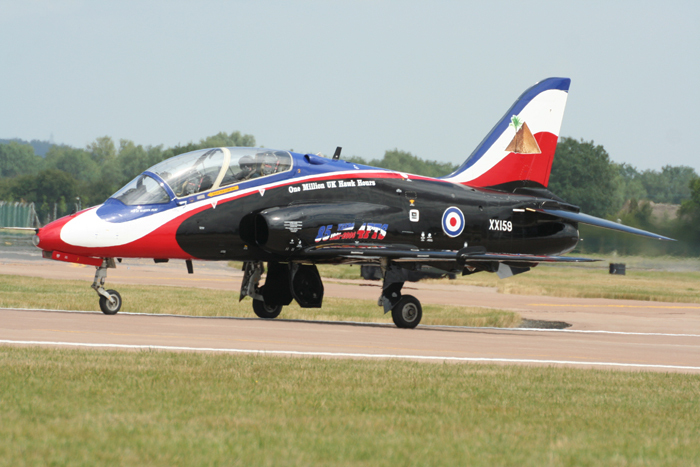 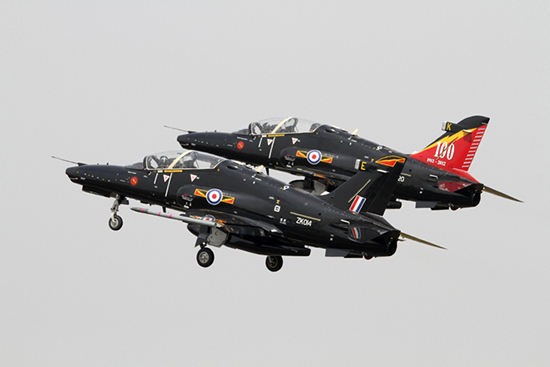 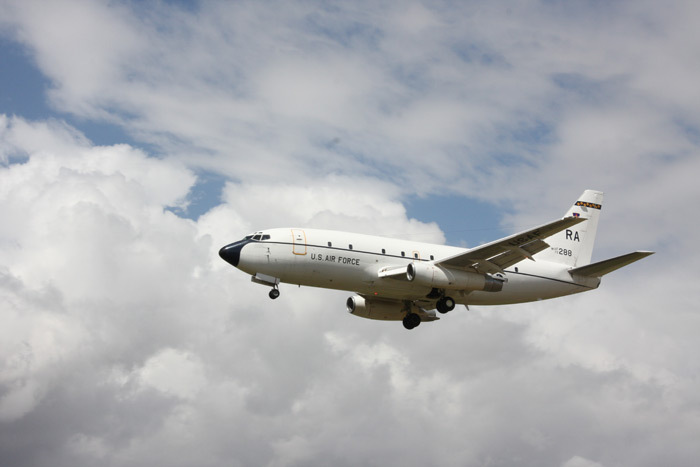 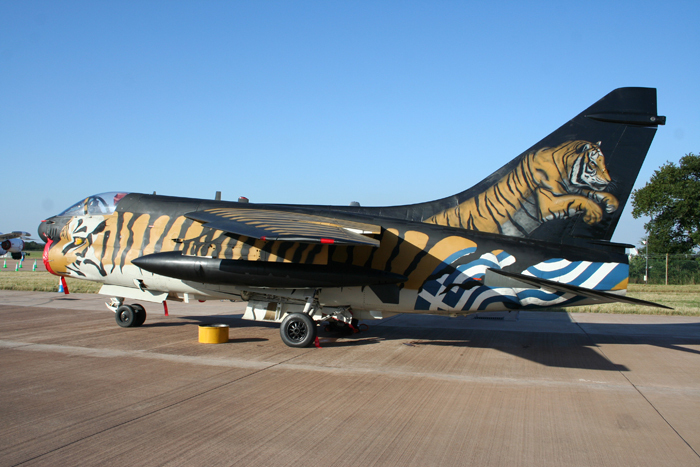 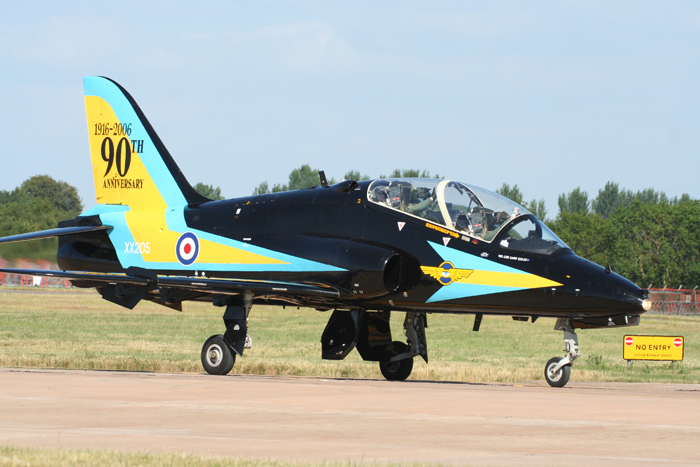 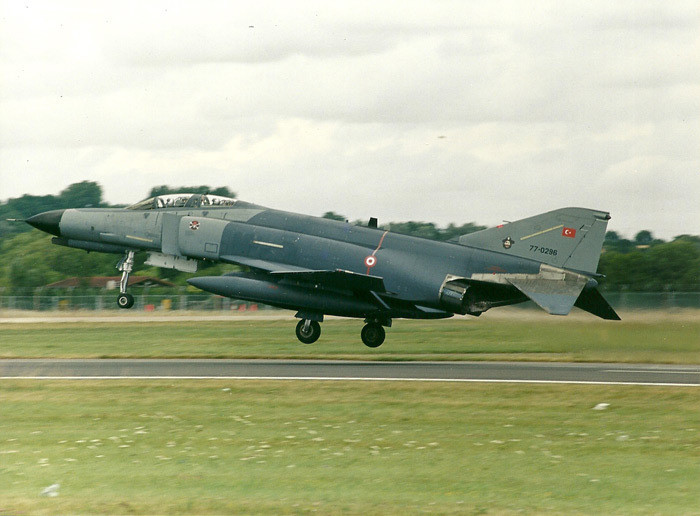 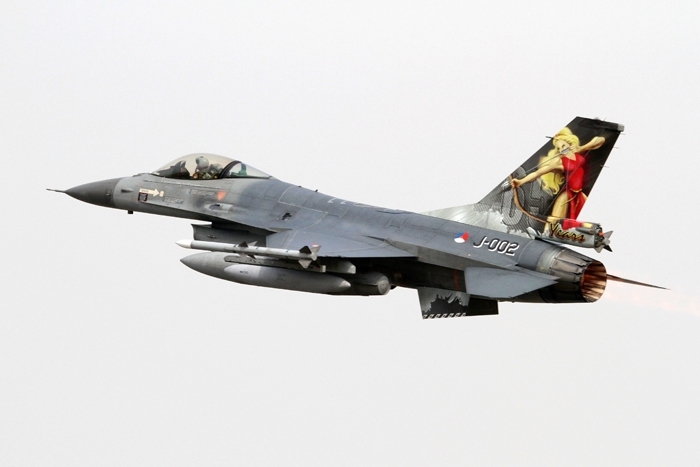 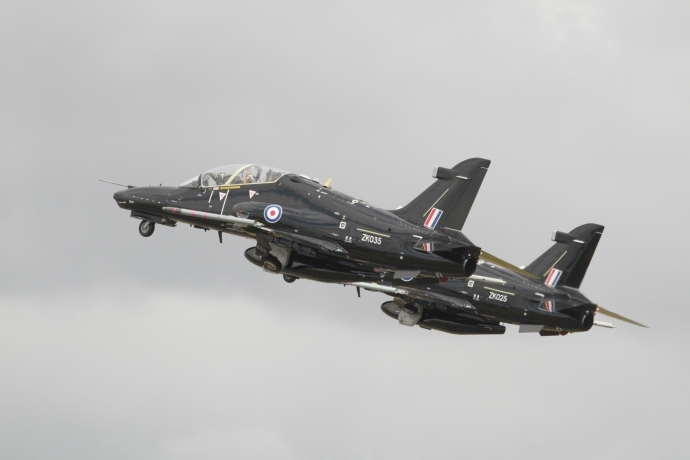 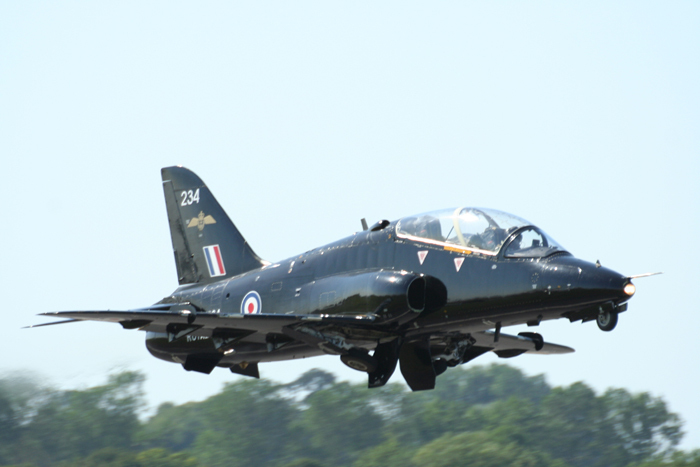 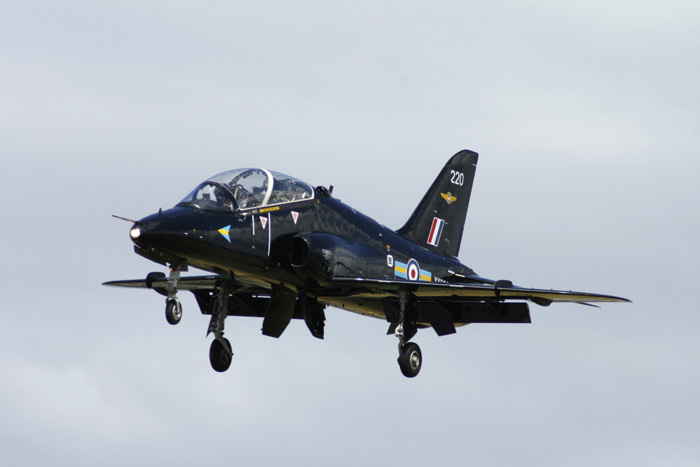 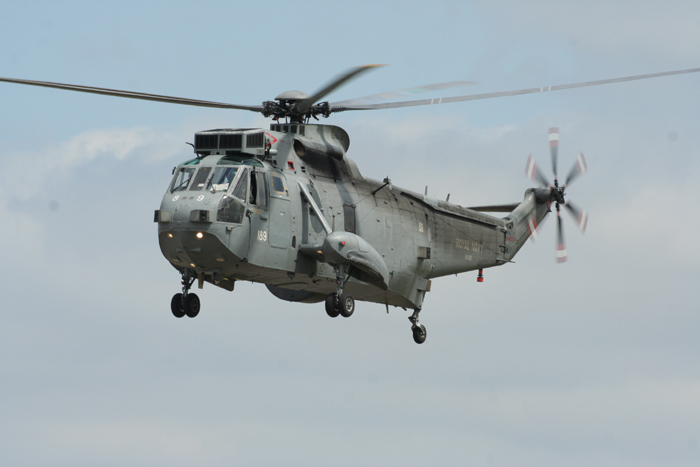 RIAT is held in support of the Royal Air Forces Charitable Trust. 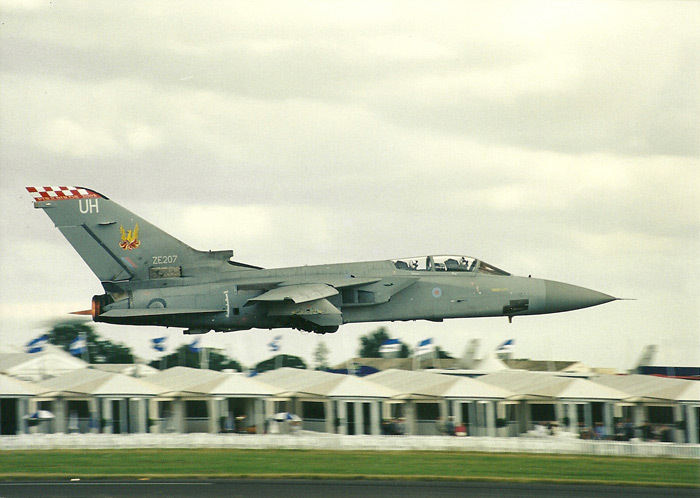 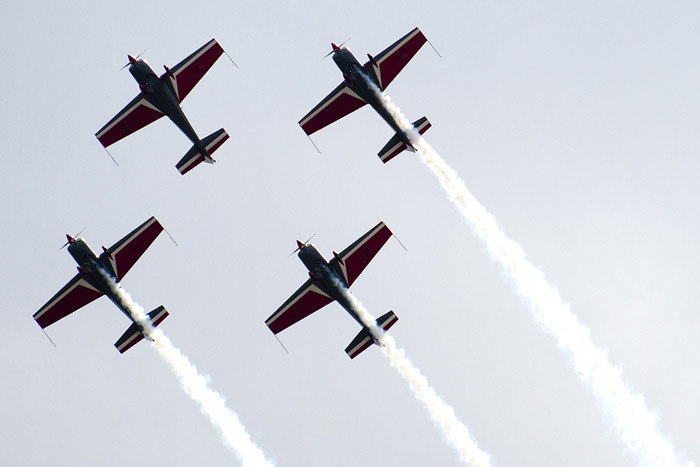 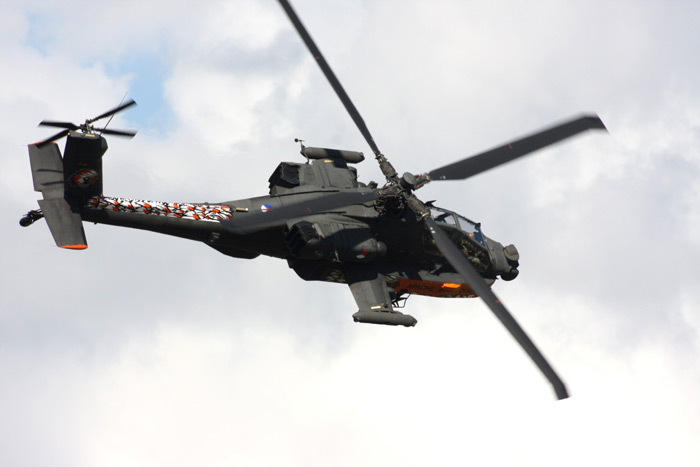 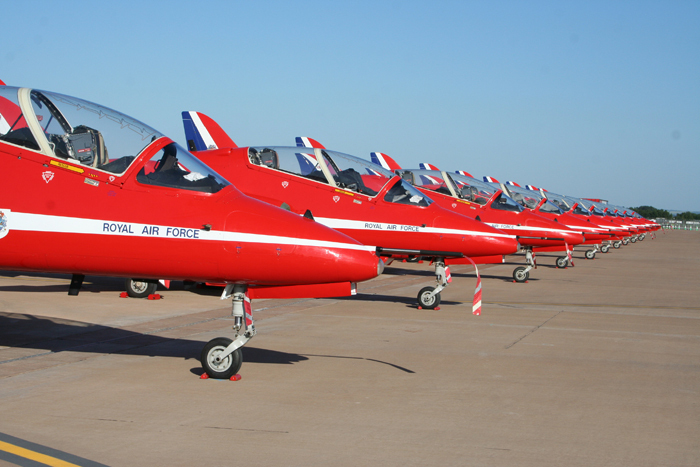 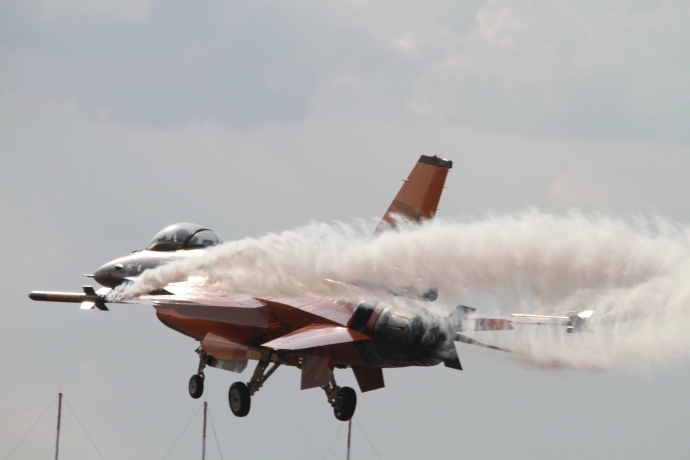 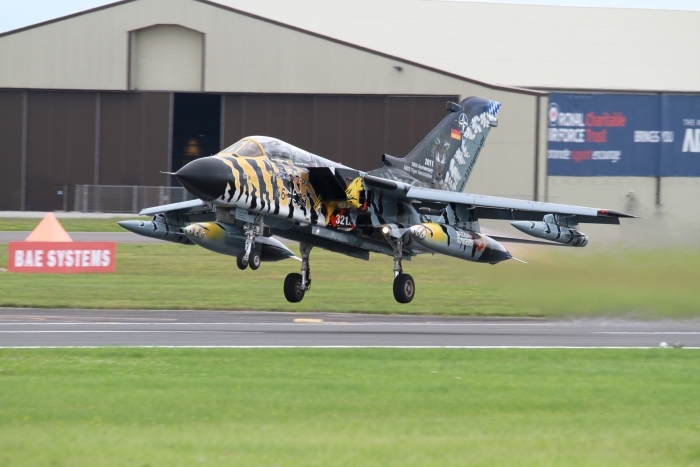 RIAT is known to thousands as the Royal International Air Tattoo, one of the biggest air shows around the globe. 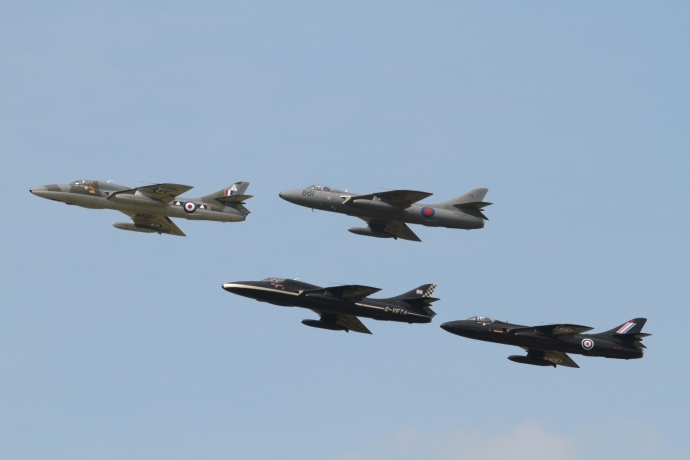 This year there were a lot less aircraft than normal but still enough to keep the enthusiast and the spotters happy, and the weather was kind. 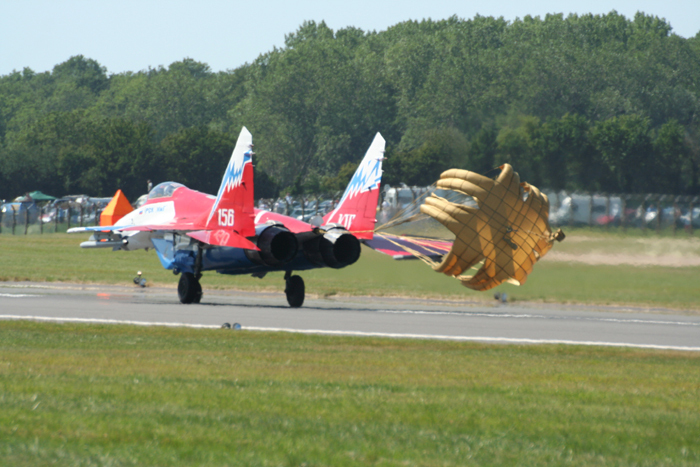 On the static line there were a few interesting sights for those who have not seen such aircraft before. 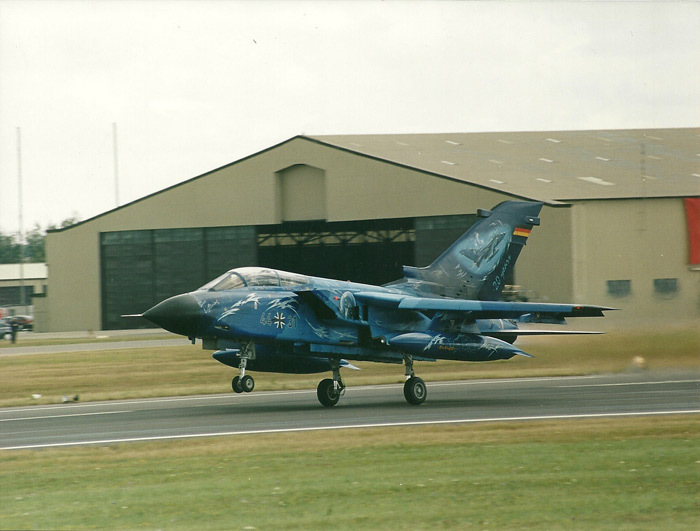 From the French Air Force, a pair of Mirage F1-CR, one with a special painted scheme, a Embraer EMB-145H from the Hellenic AF based in Greece and the return of the Breitling Super Constellation. 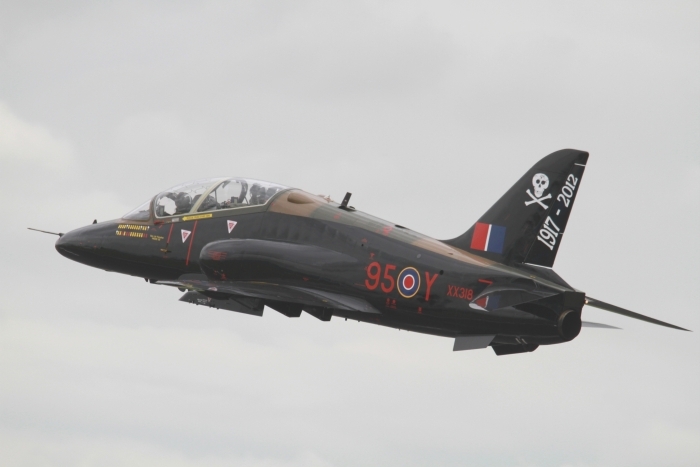 With a good display programme over the two days of 20/21 July, it was put together with interest. 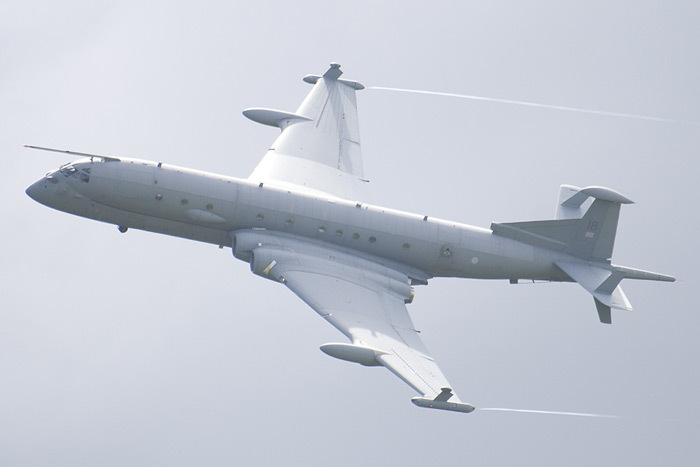 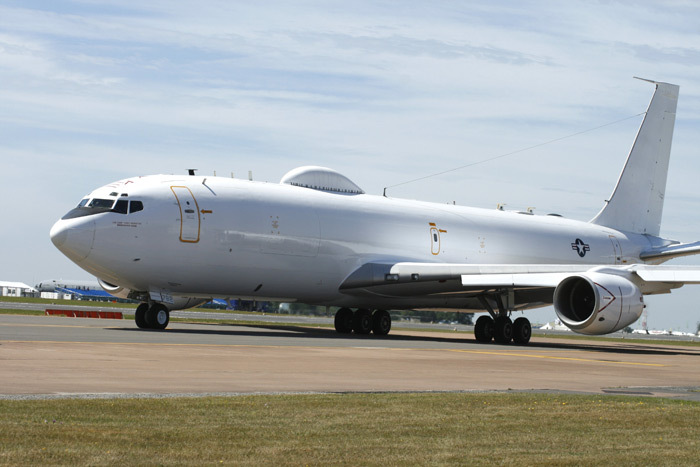 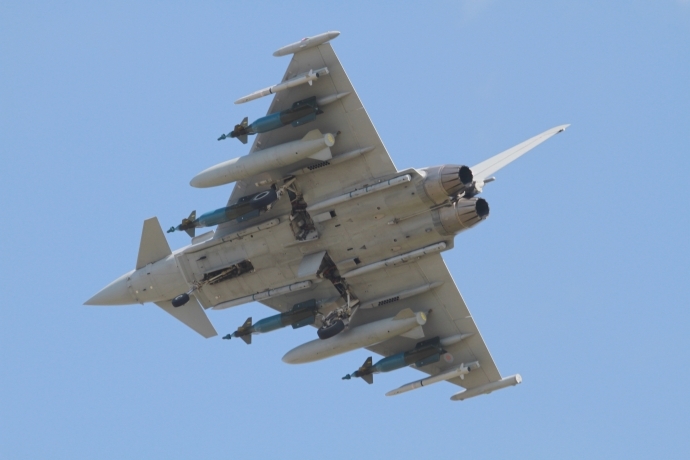 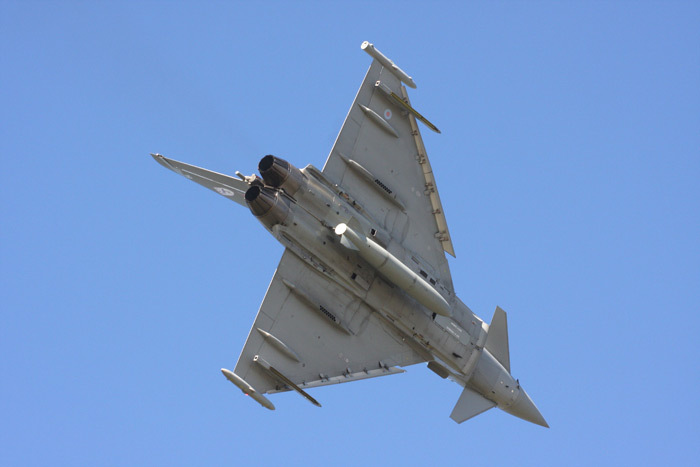 Saturday, two flypasts, the first was a Boeing KC-767A from the Italian AF of 14 Stormo/8 Group with a pair of Typhoons, one from the Italian AF and the other from the Royal Air Force, and later in the day's display, a British Airways Airbus A380-841 flew in formation with The Red Arrows, impressive. 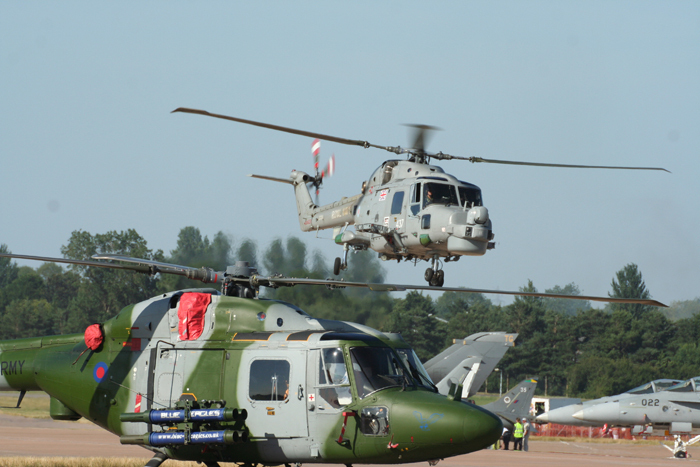 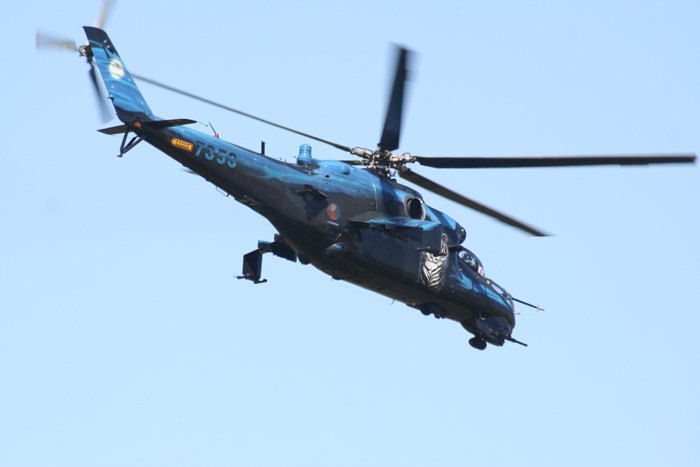 Solo displays, Augusta A109 BA helicopter from the Belgian Air Component. 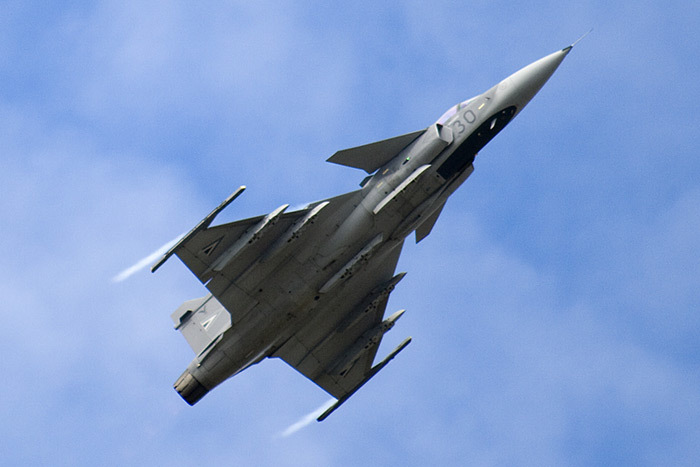 Saab Jas 39C Gripen Swedish AF, Mig-29 from the Polish AF, Alenia C-27 Spartan of the Italian AF, followed by with exuberant displays from the RAF's Typhoon FGR4 and Eurofighter EF2000 of the Italian AF. 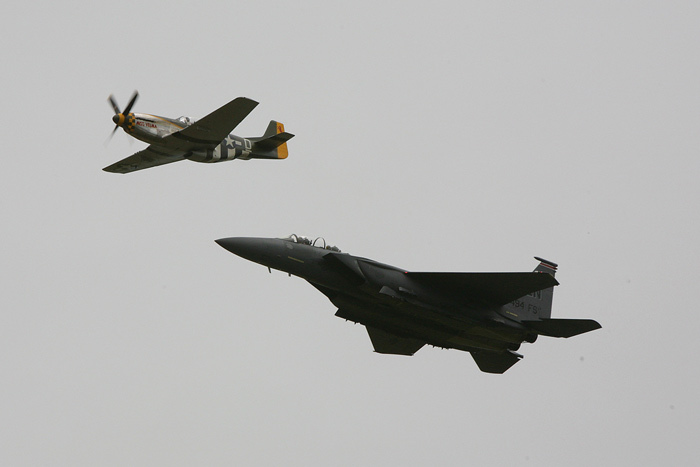 Other solo displays did not disappoint. 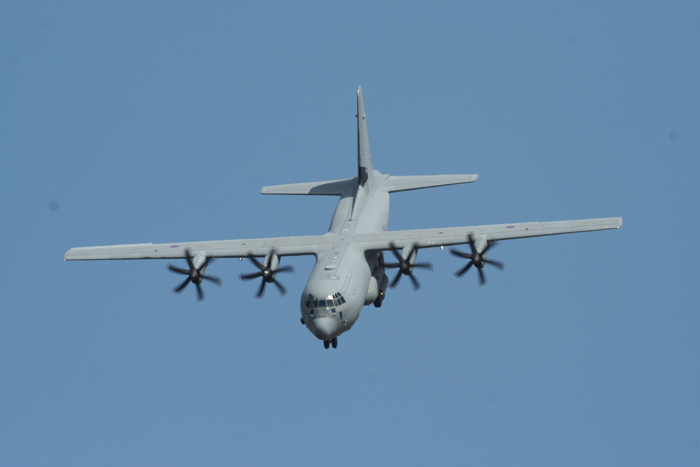 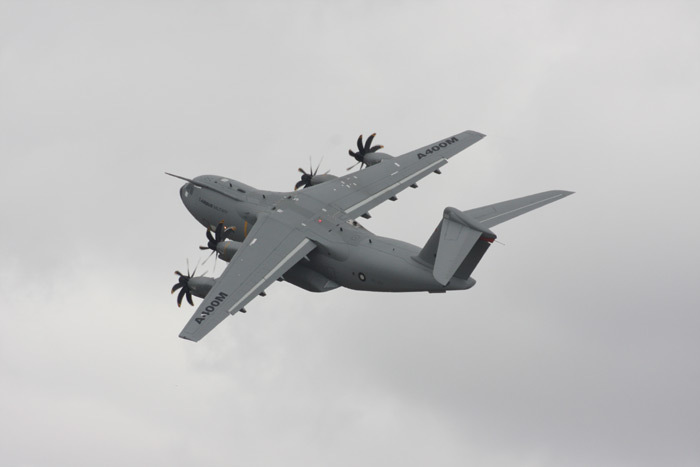 Another flypast surprise on Sunday was the A400M Transporter, it flew with The Red Arrows, nice one. 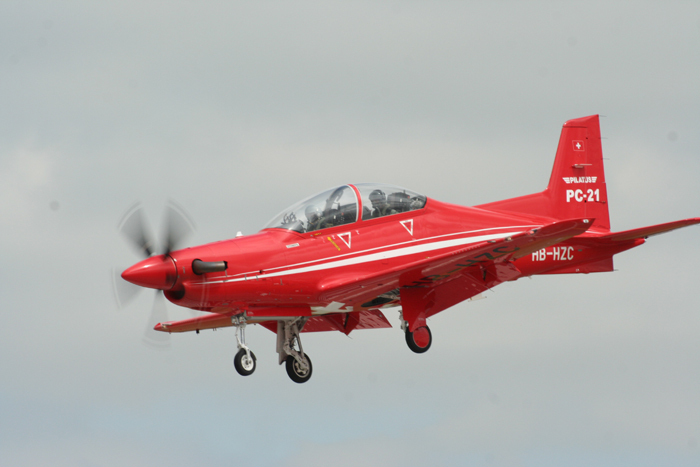 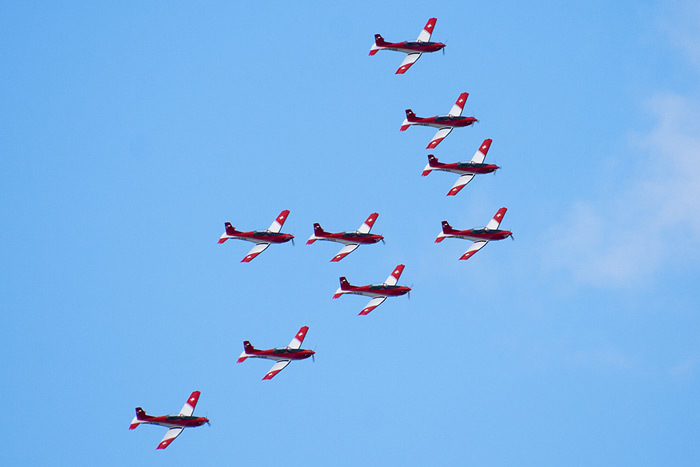 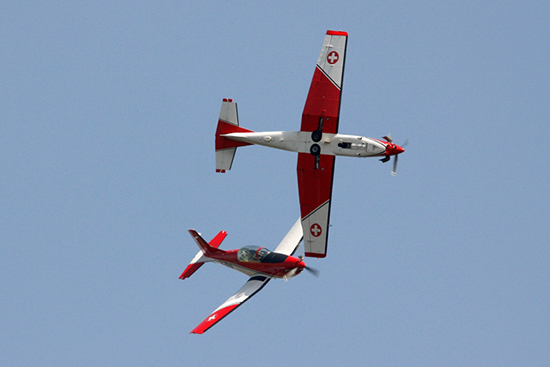 Back with one of the display teams, and they were the PC7-Team 9 Pilatus aircraft from the Swiss AF, good quality display. 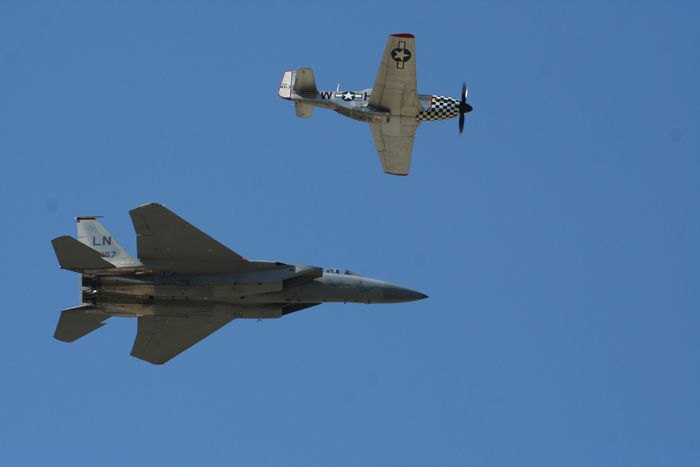 Good weekend. 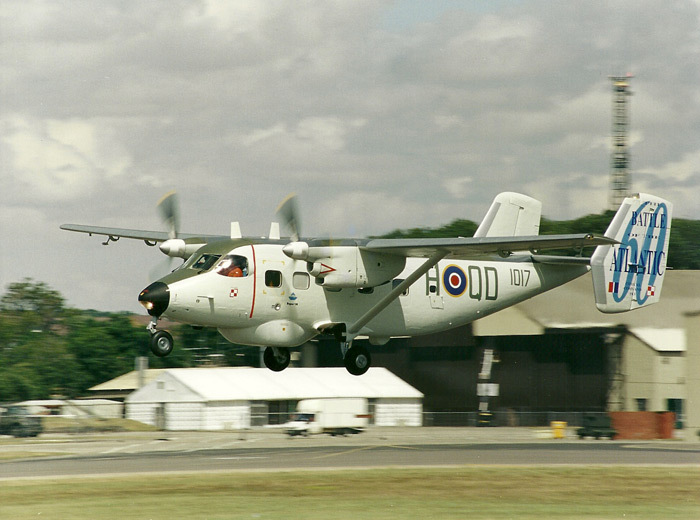 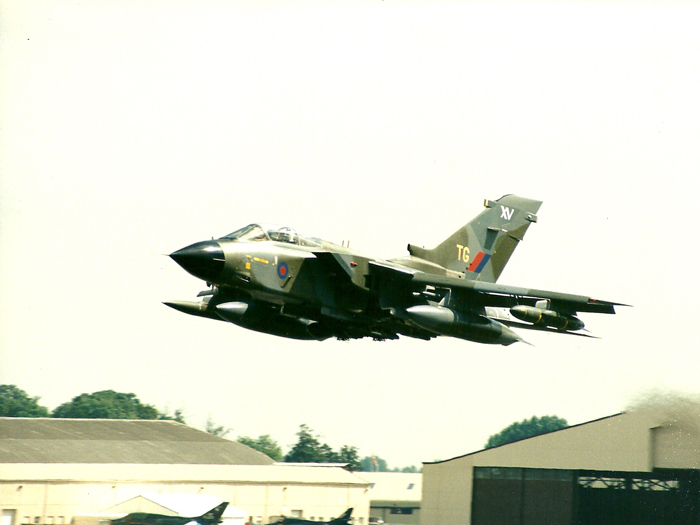 From the time of arrivals, to the time of departures, the Air Tattoo should give themselves a pat on the back. 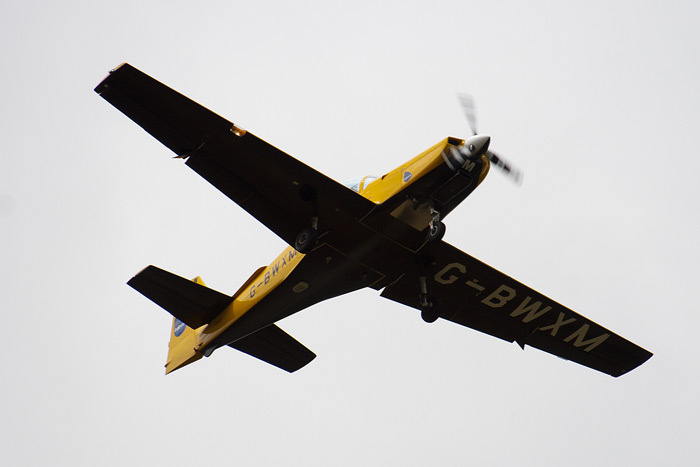 At most sporting venues the weather can make a big difference, like rain stops play, and with the weather not being that good, a lot of enthusiasts were starting to say where has all this rain come from, and will it stop the flying? 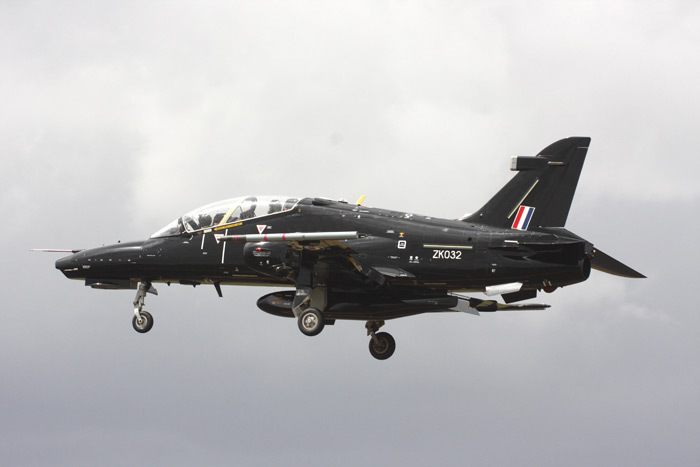 After days of rain leading to a weekend of flying at the Air Tattoo at RAF Fairford, Friday was not a good day for the remaining arrivals and for practice displays, but it did go ahead, with solo and display teams alike, a credit to all those who flew. 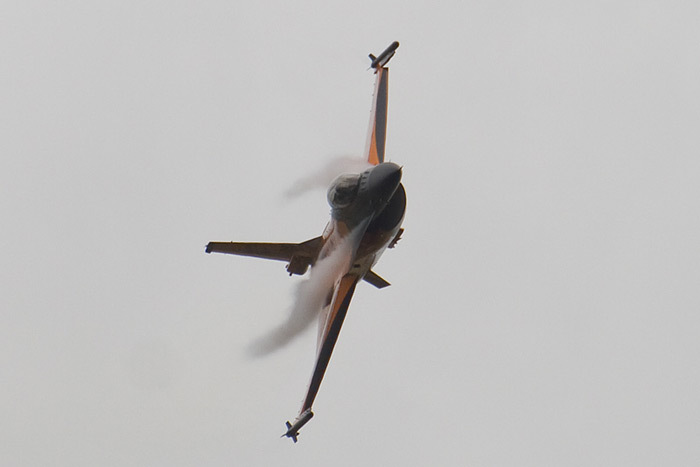 Saturday the first of the two days drying out from the day before, it started well but as soon as the displays started the grey and low clouds rolled in, that spoilt an opportunity to photograph very rare aircraft like the Yakovlev Yak-130 trainer from Russia, a very worthwhile display to watch and not always through the lens. 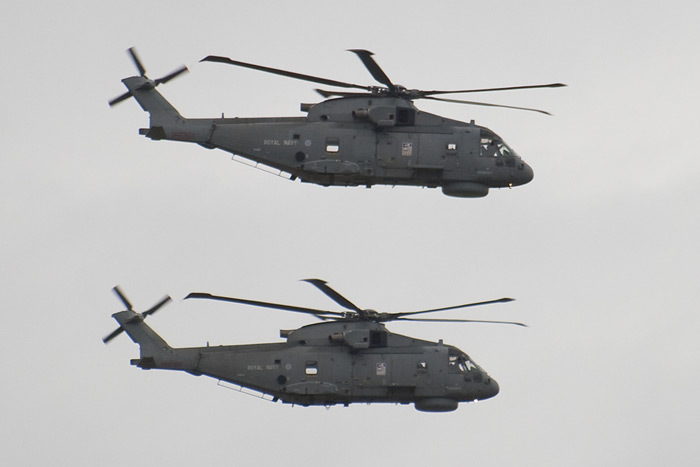 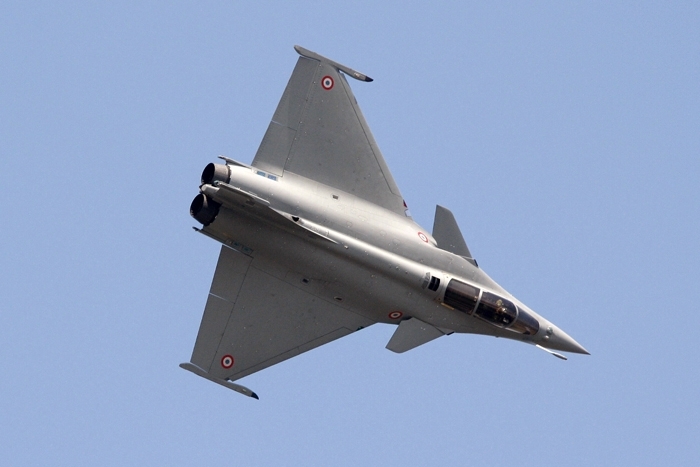 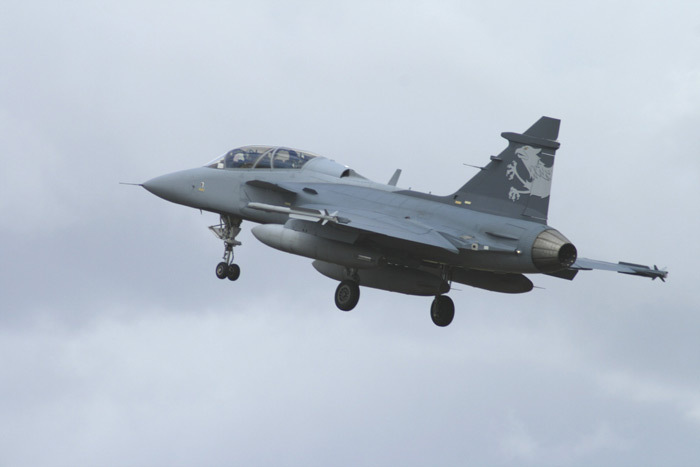 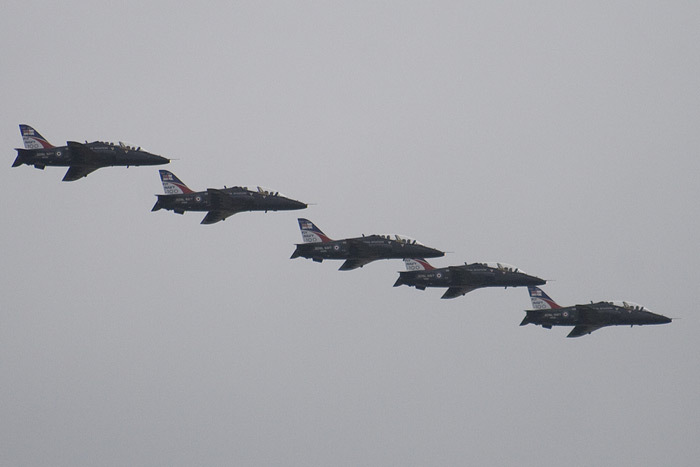 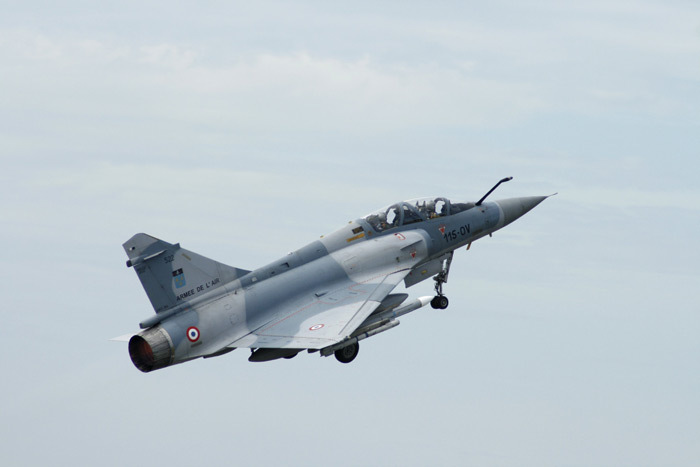 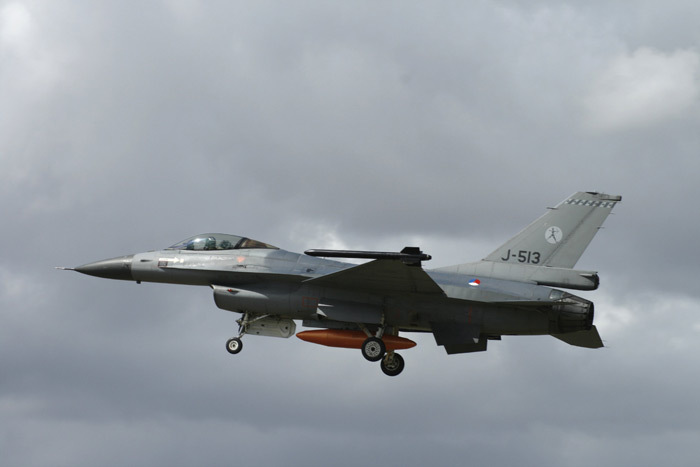 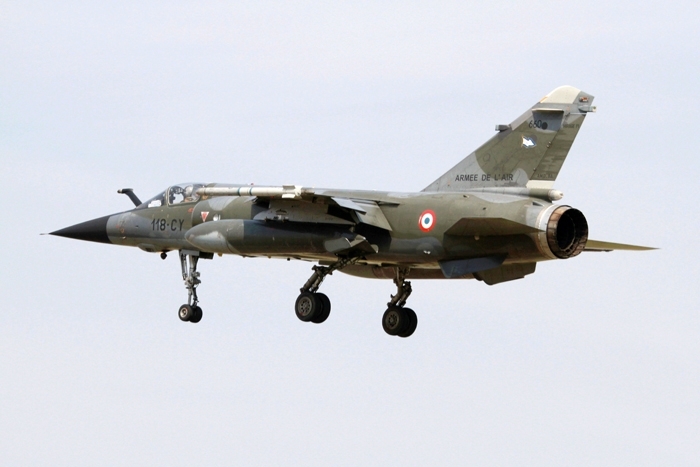 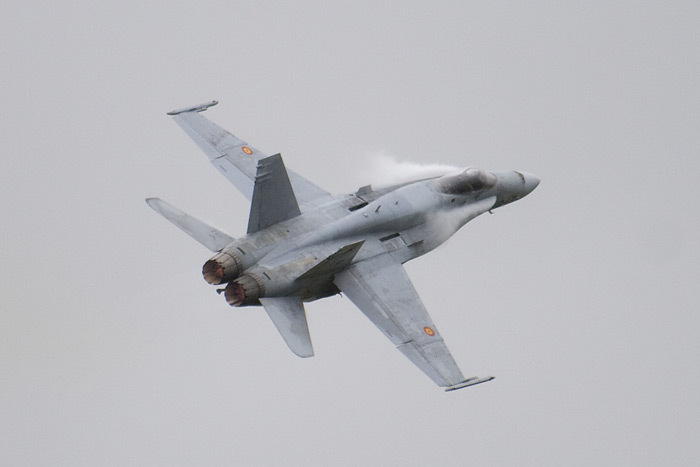 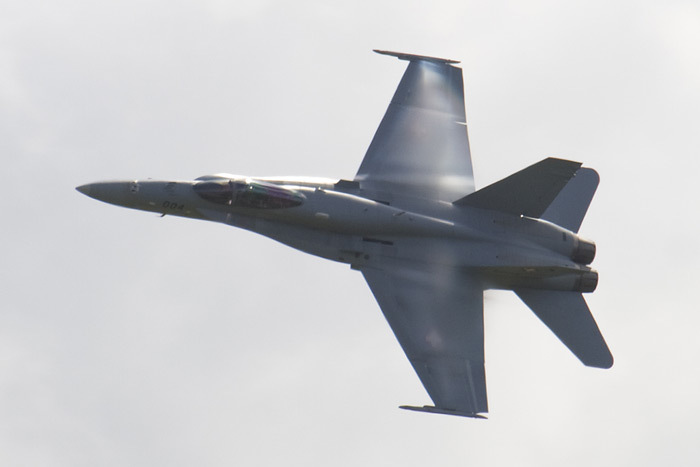 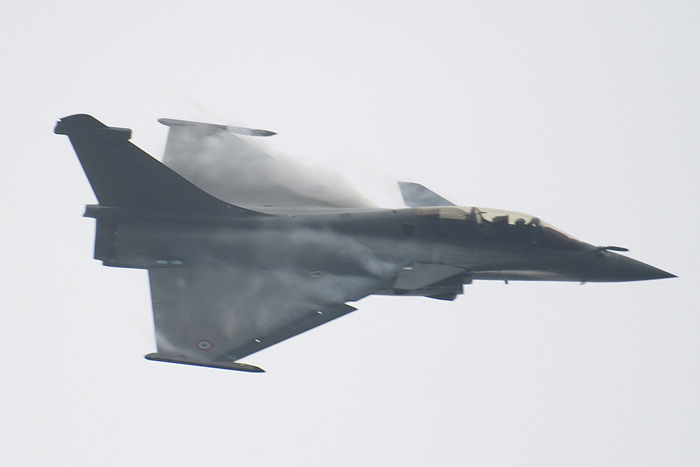 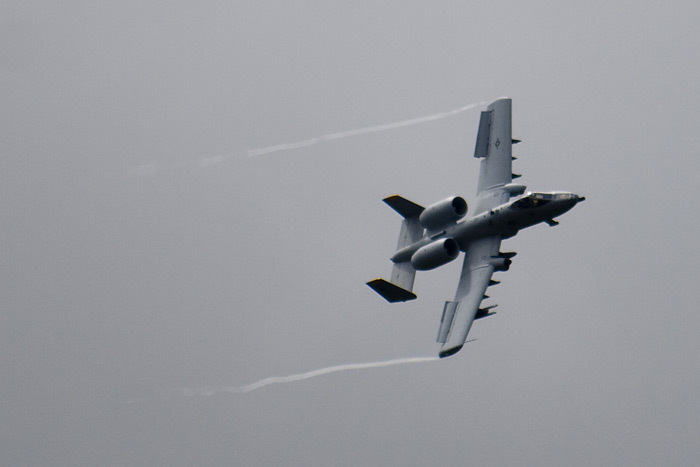 Aircraft such as the Gripen, F/A-18 Hornet, MiG-29, Agusta 109, and Rafale from the French Air Force were much the same, good displays under very grey skies and the odd shower. 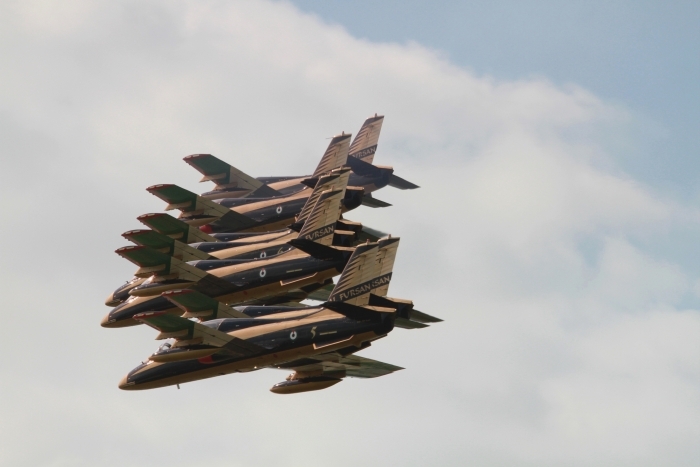 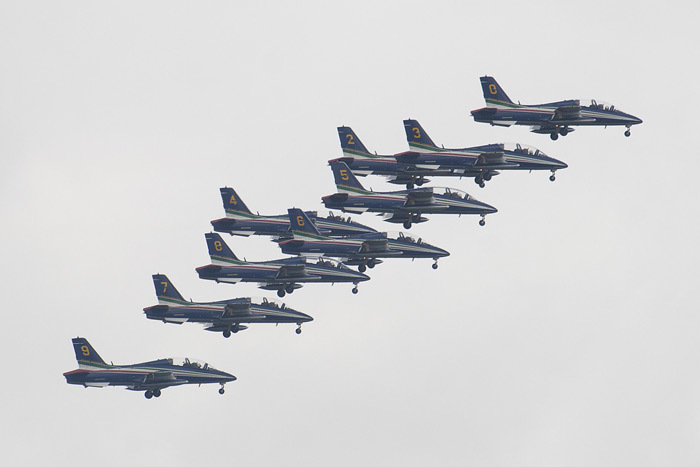 Display teams, well what can you say, especially the Black Eagles from the Republic of Korea with their eight T-50b advanced trainers, first visit to the UK and what a performance they gave, awesome. 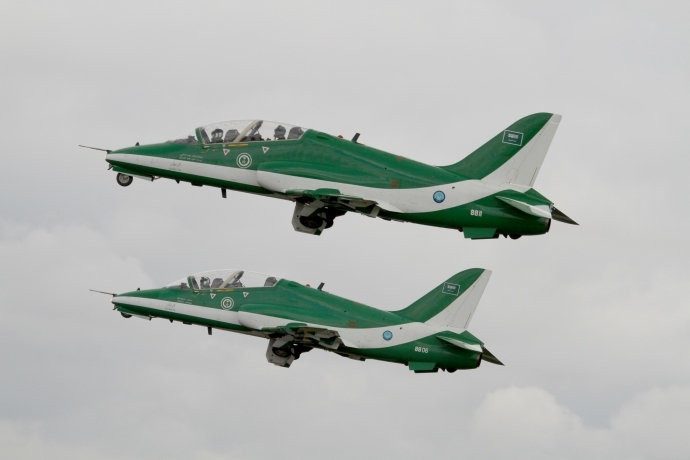 Also not to forget another first UK visit was Al Fursan (The Knights) performing their display, from the United Arab Emirates. 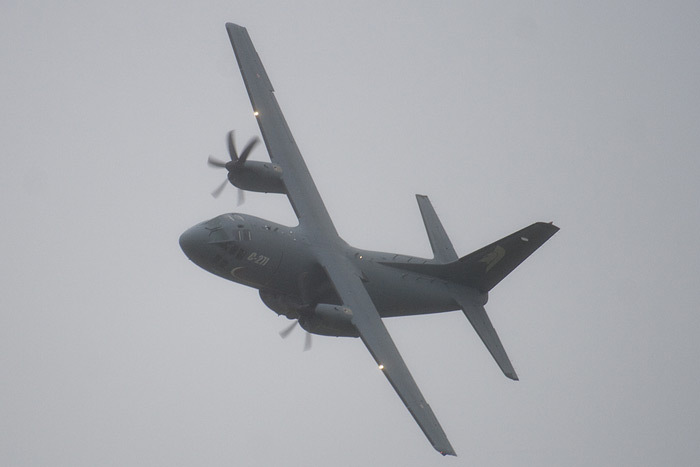 The weather took its toll on Saturday. 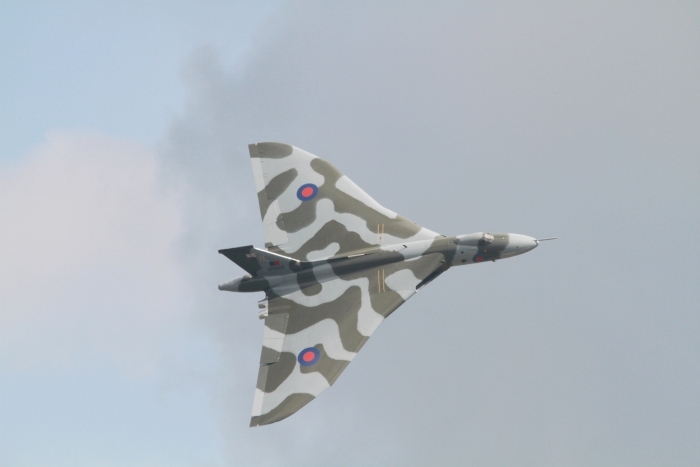 Sunday, we were all hoping for better weather and we were lucky to have it. 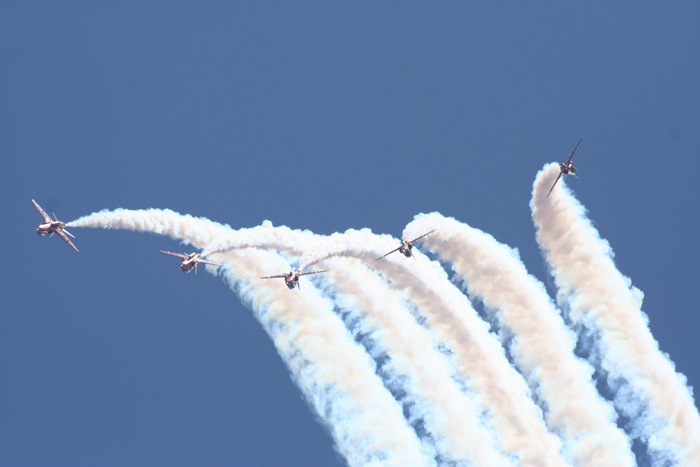 All displays were good, with the extra high ceiling and blue skies which made sure the camera was being used more than the day before, but still at times it was worth just watching the displays. 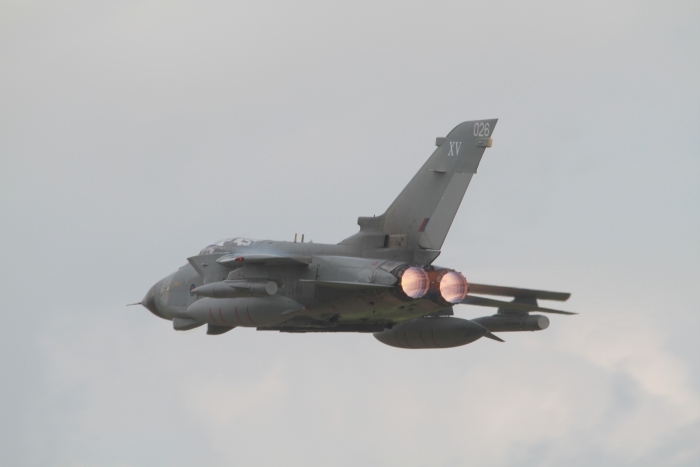 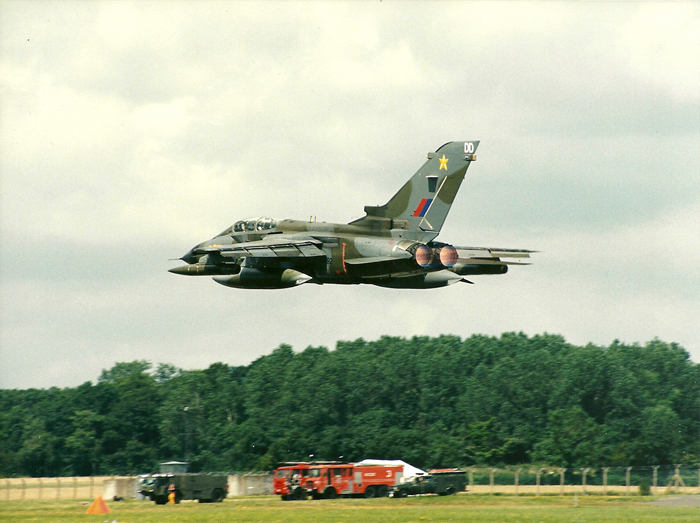 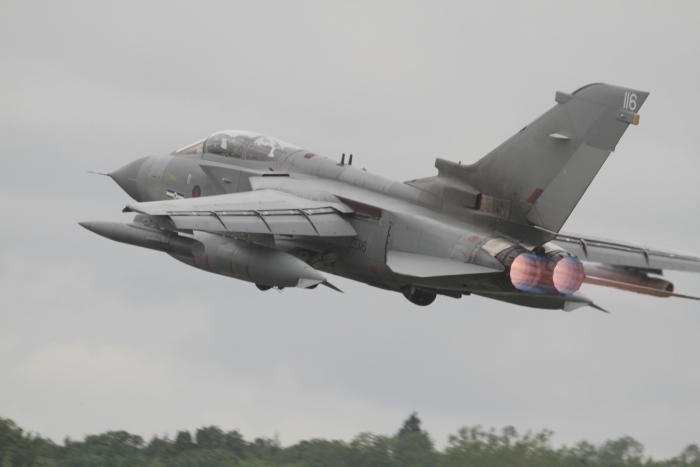 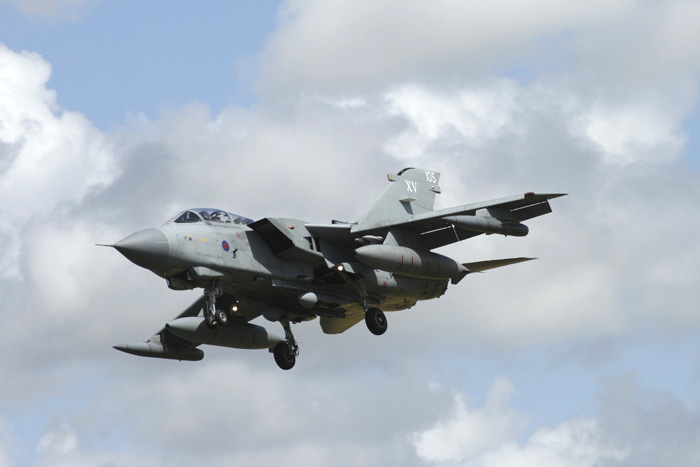 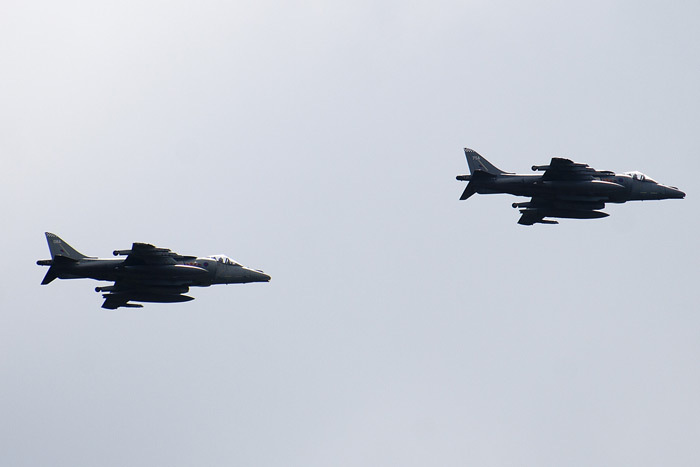 The RAF role demo was excellent, the GR4 Tornados role demo from the No. 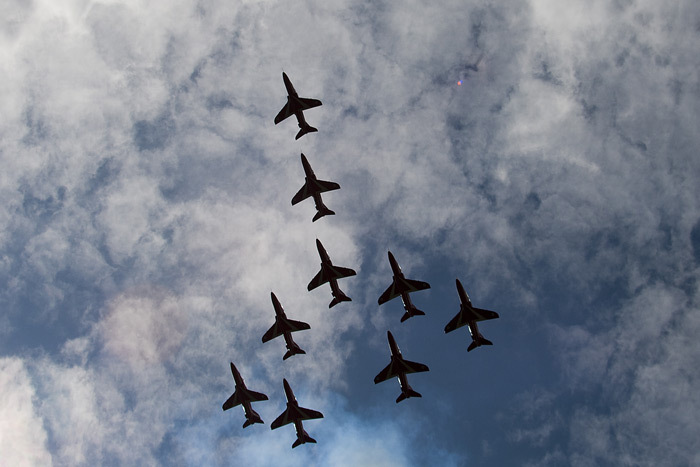 XV(R) Squadron showed how realistic it can be deployed in operations, at the end of their demo a slow flypast was carried out and one aircraft broke formation as a tribute for the squadron members who lost their lives recently. 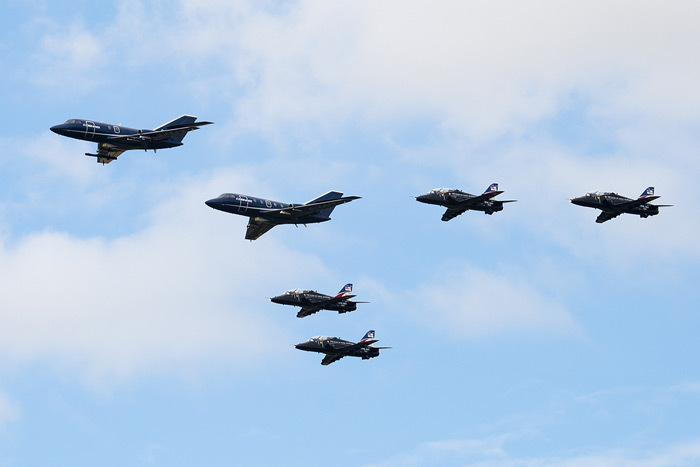 For those display teams on their first UK visit, and all other displays that took part it made a weekend worth seeing and not to forget the E II R formation flypast of 27 Hawks. 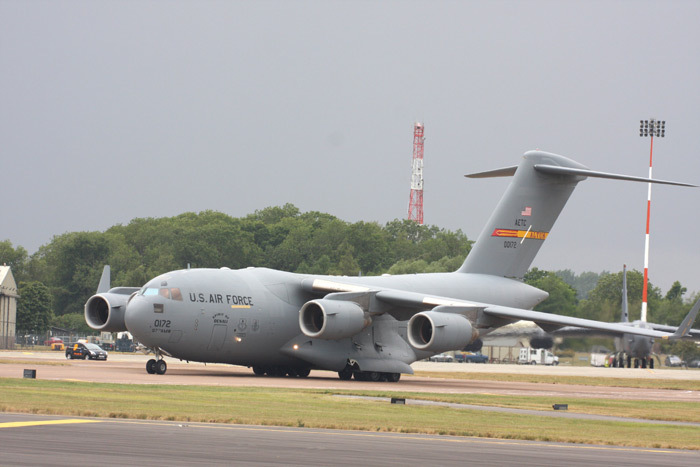 A good static line up and a few that stood out from the rest, a first time visit to the UK was a Japanese Boeing KC-767 and also it was good to see back at Fairford, a B-2 Spirit, and a C-5 Galaxy. 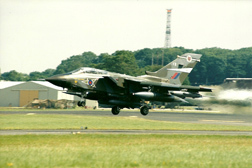 2011 was the 40th anniversary of the Royal International Air Tattoo, who would have thought back in 1971 that the Air Tattoo would have still been going strong forty years on. 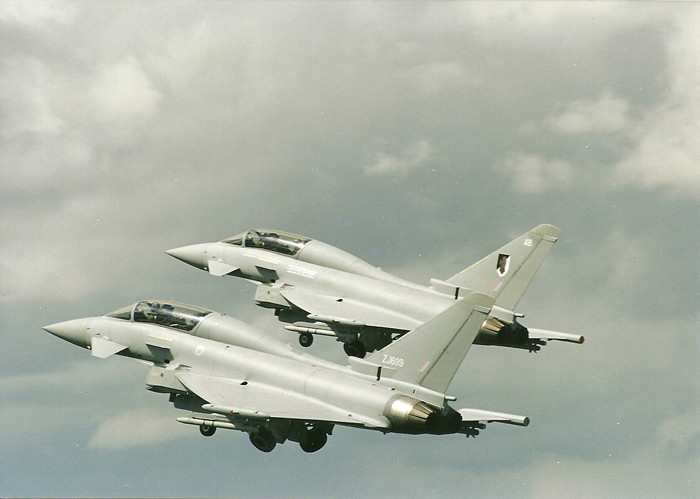 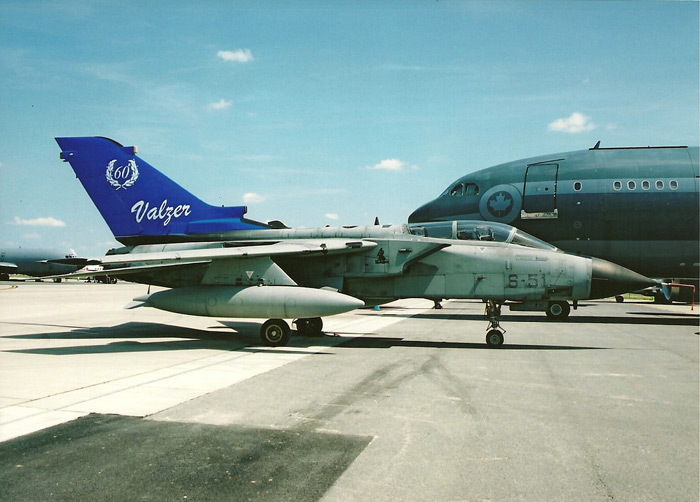 Many things have changed during those forty years including the end of the Cold War and wars in Afghanistan and Iraq and a much reduced variety of aircraft available to the world’s air forces. 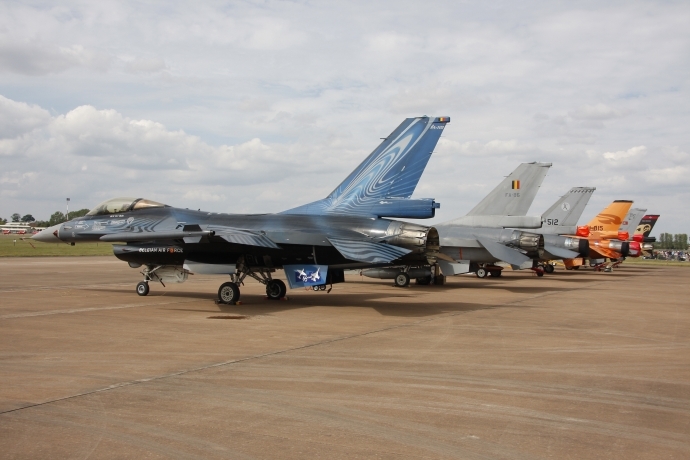 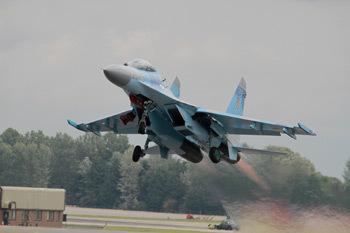 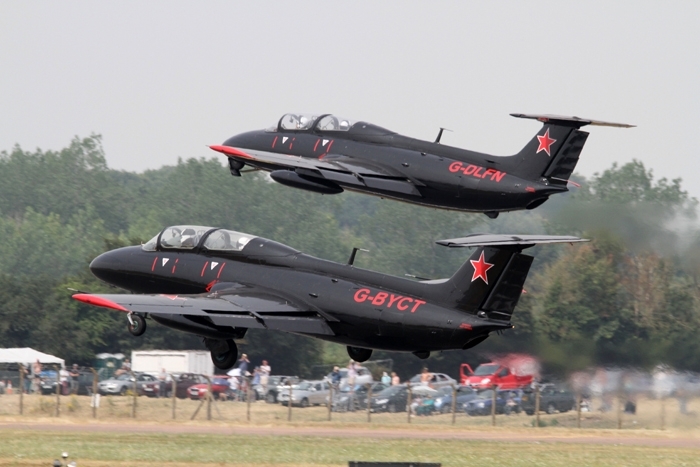 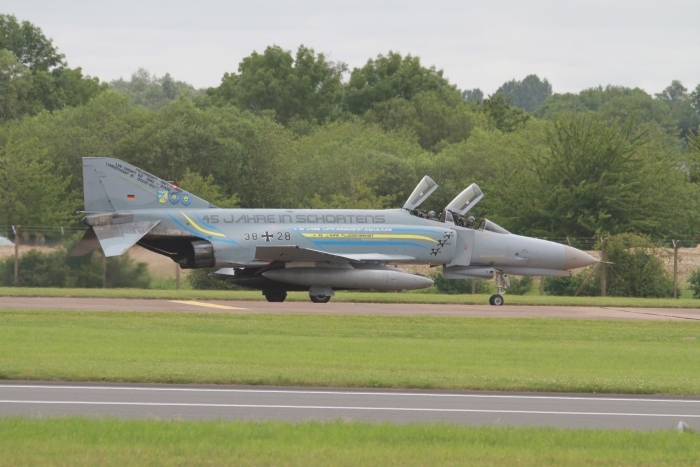 The Air Tattoo's static display was smaller than other years but still attracted a variety of aircraft, some well known but some rarities such as the Ukrainian Air Force Sukhoi Su-27 (Flanker) and the Ilyushin transport aircraft. 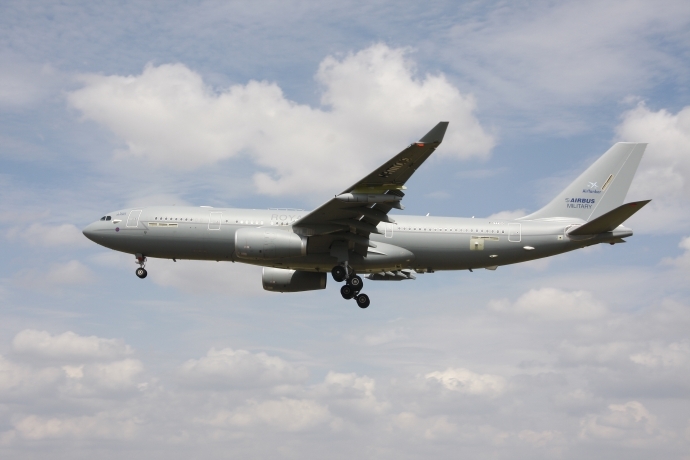 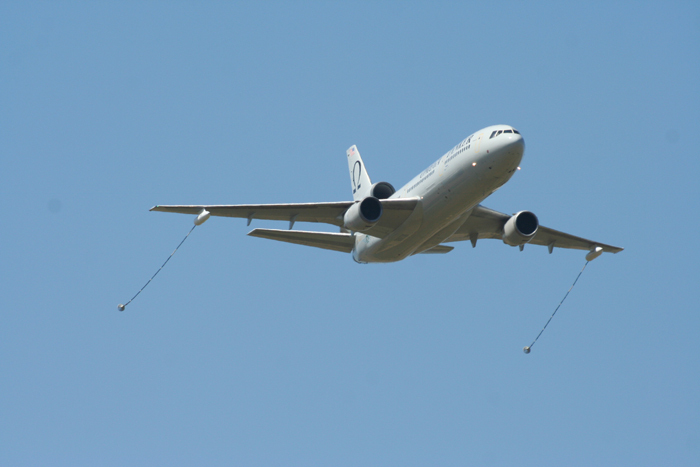 Another event this year was the first public appearance of the RAF's newest aircraft the Airbus A330 Voyager. 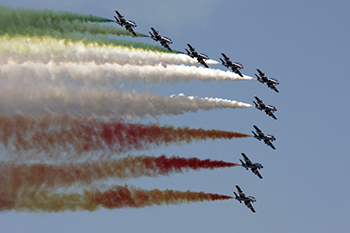 RIAT sported its fair share of display teams this year including, The Red Arrows, Team Viper with their Hawker Hunters, The Frecce Tricolori and The Patrulla Aguila. 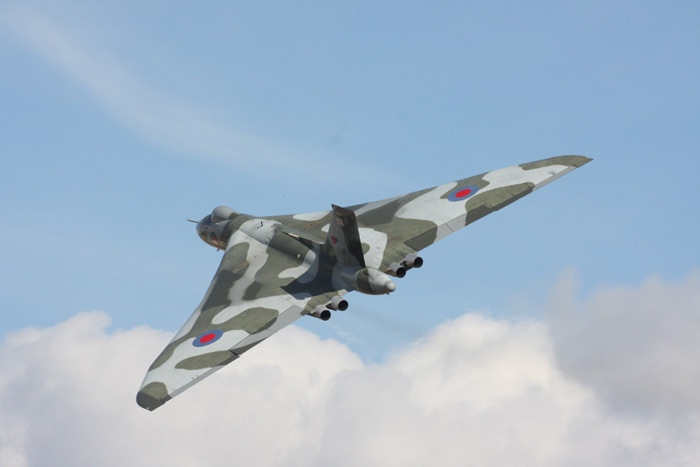 Other aircraft displaying included The Battle of Britain Memorial Flight, BAE Systems Typhoon, A-10 Thunderbolt, The Breitling Wingwalkers, Avro Vulcan and many old favourites. 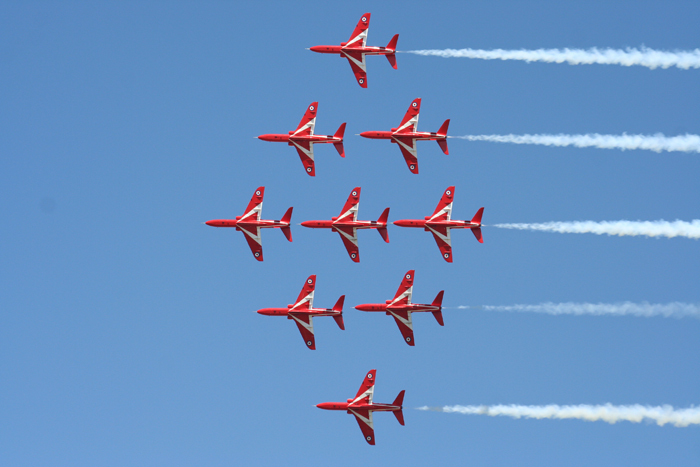 The attendance this year was down but in these uncertain times that is only to be expected. 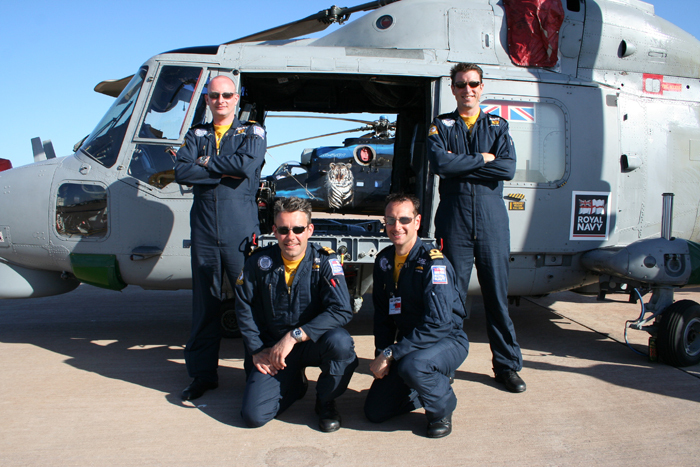 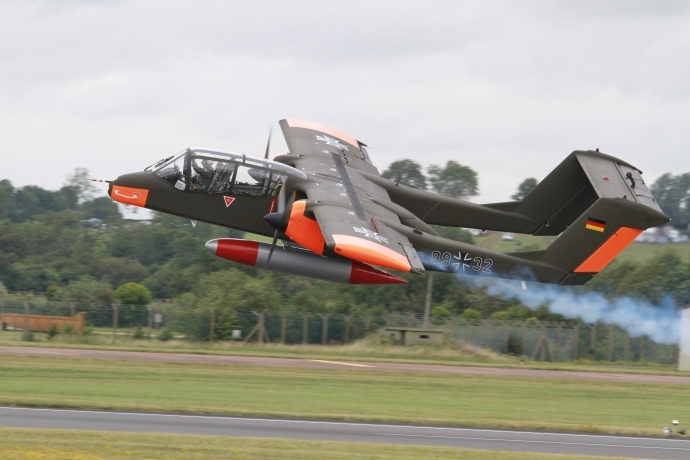 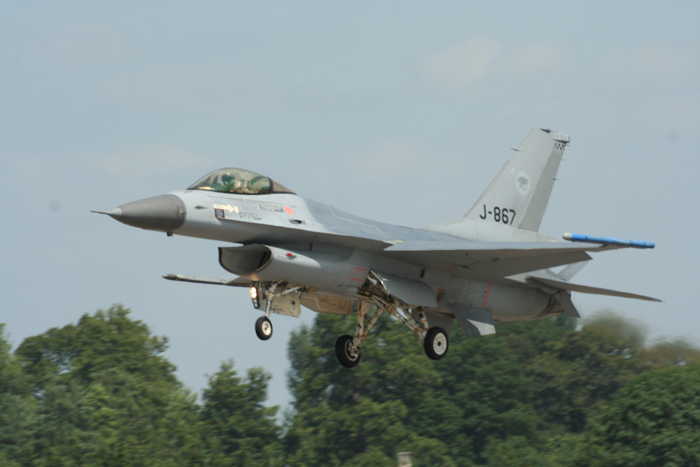 2010, another year at Fairford. 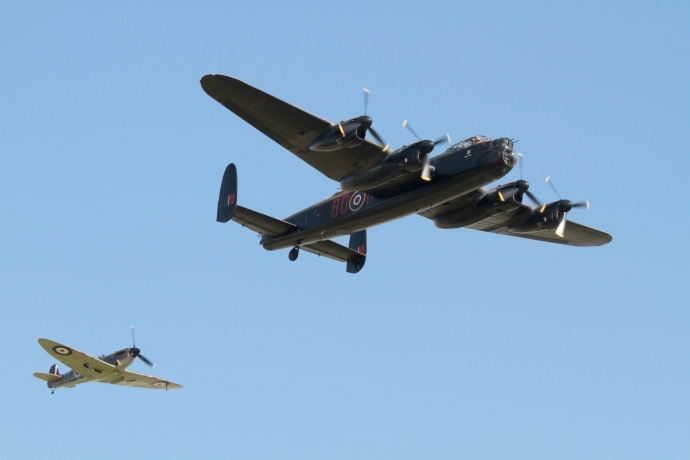 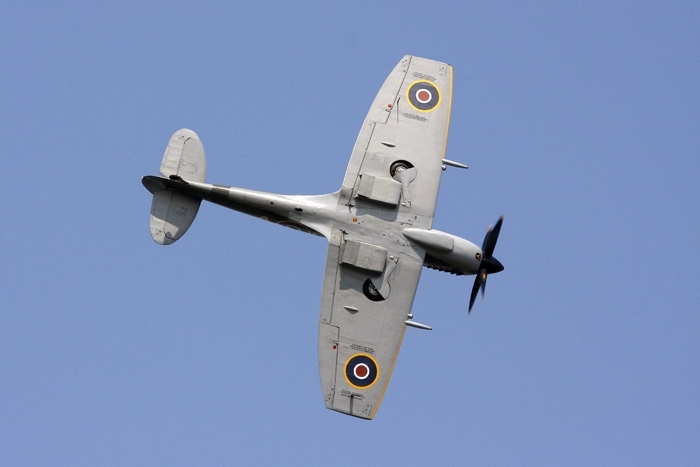 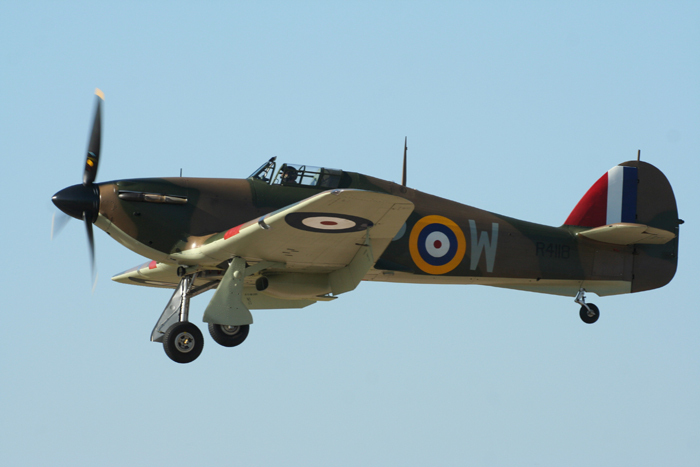 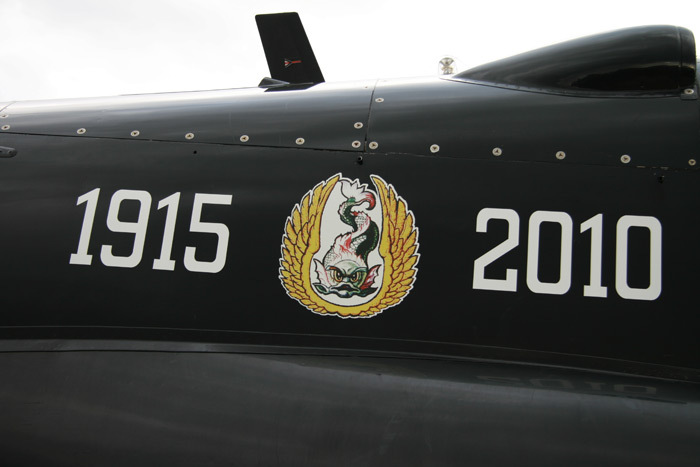 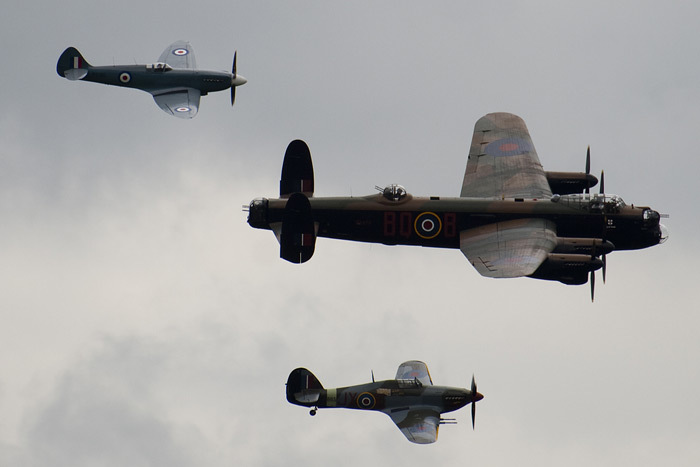 One of the themes for this year was the hosting of the 70th anniversary of The Battle of Britain. 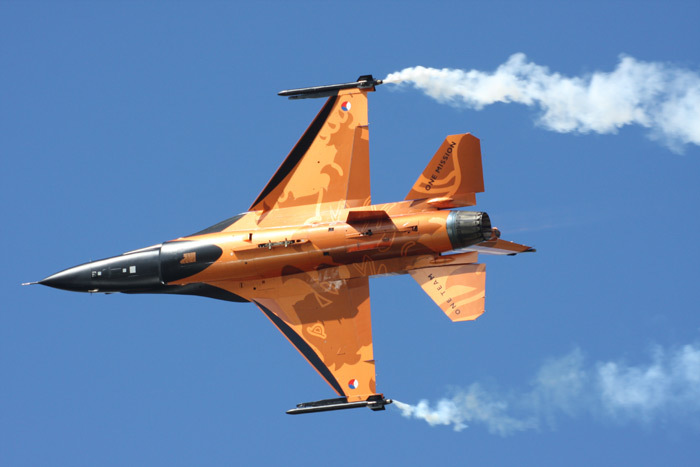 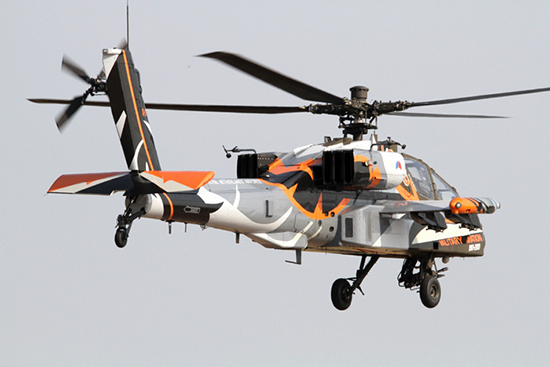 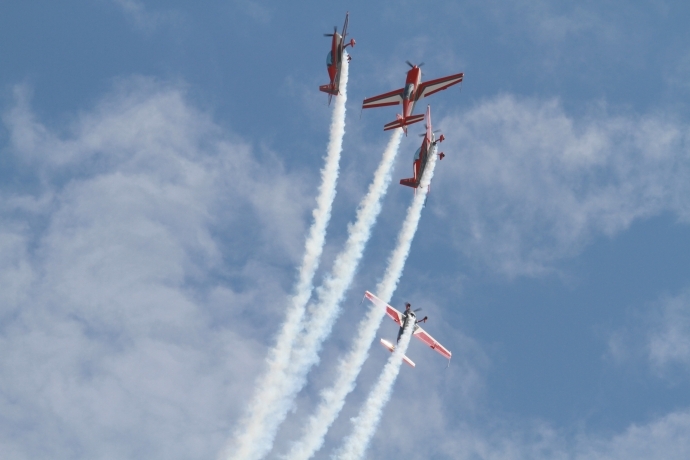 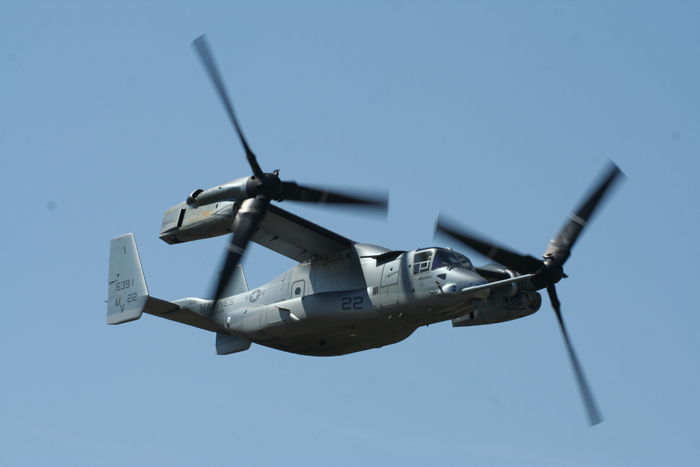 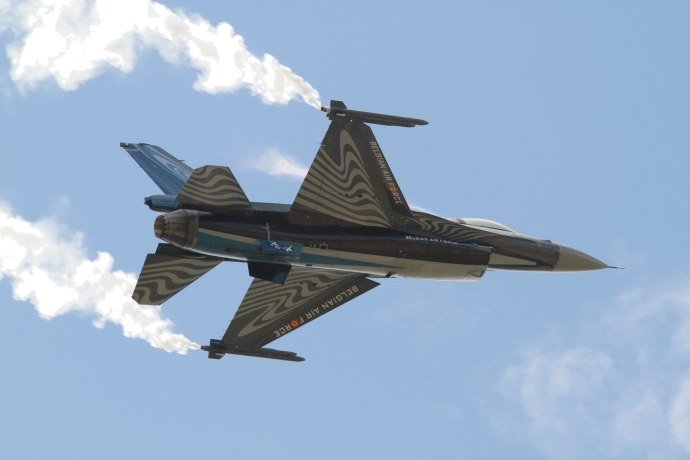 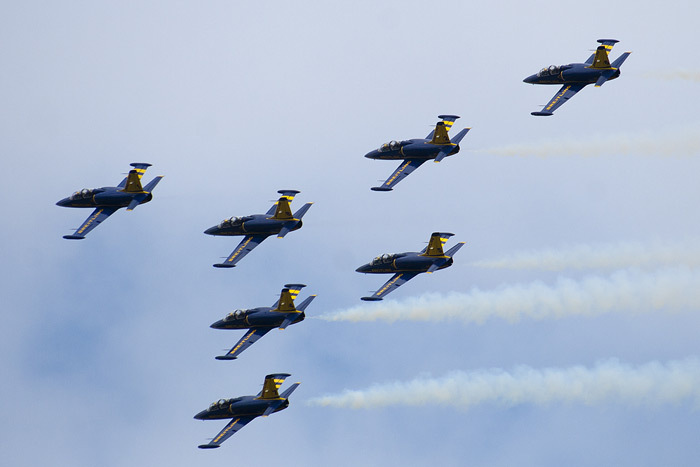 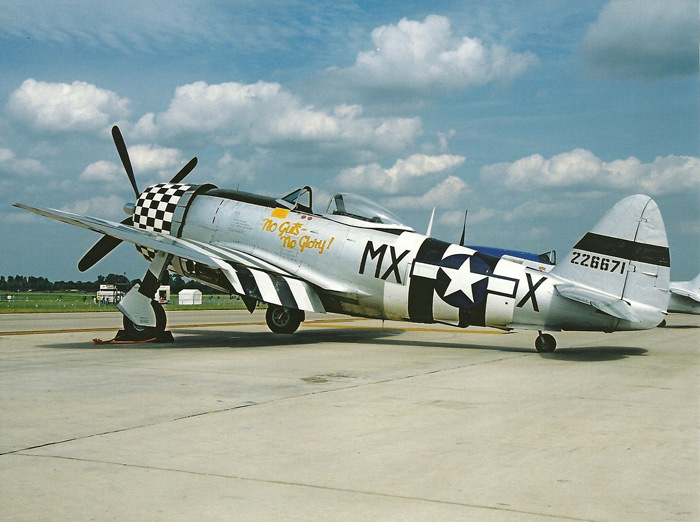 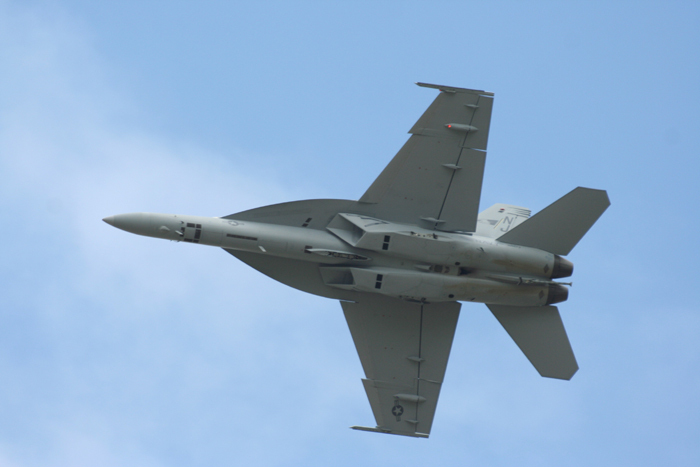 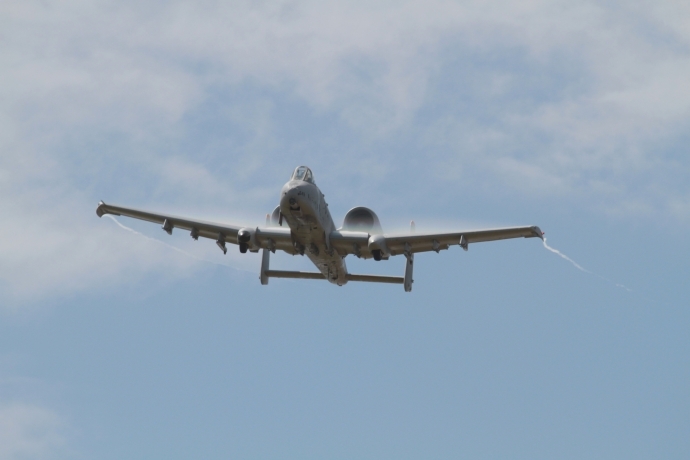 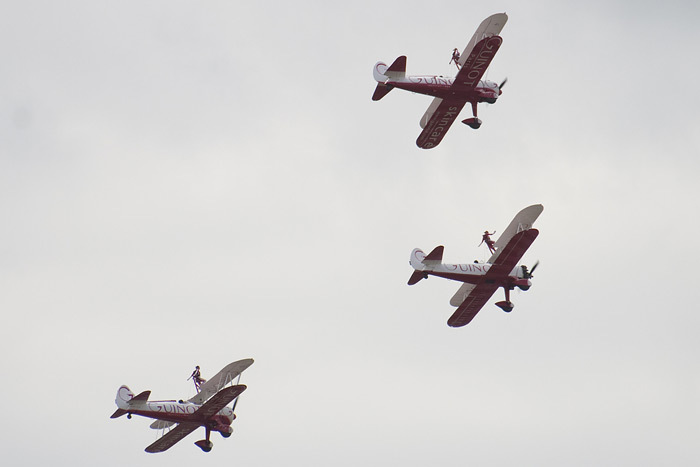 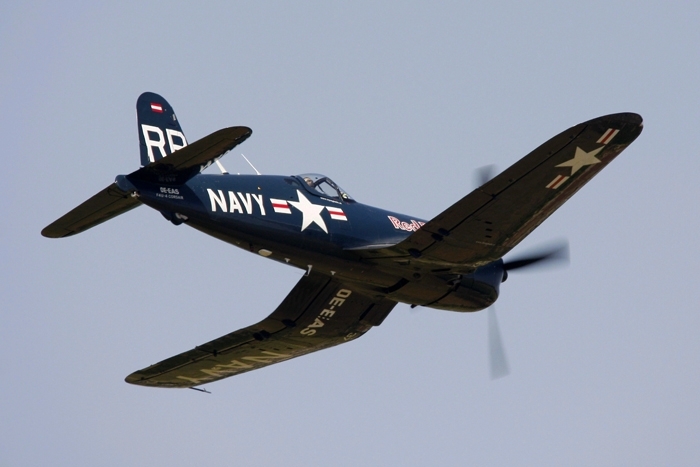 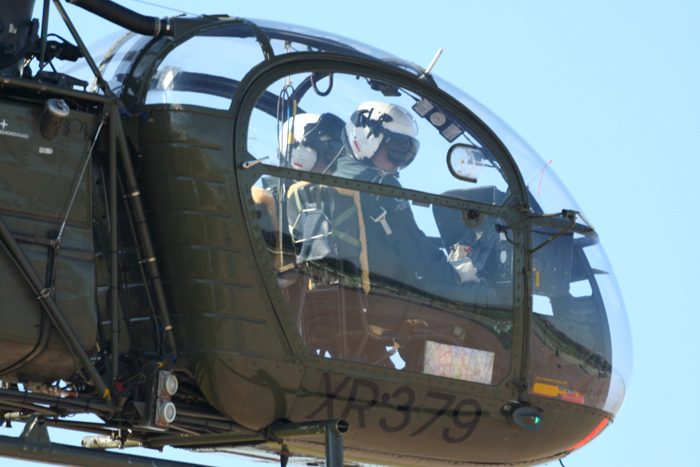 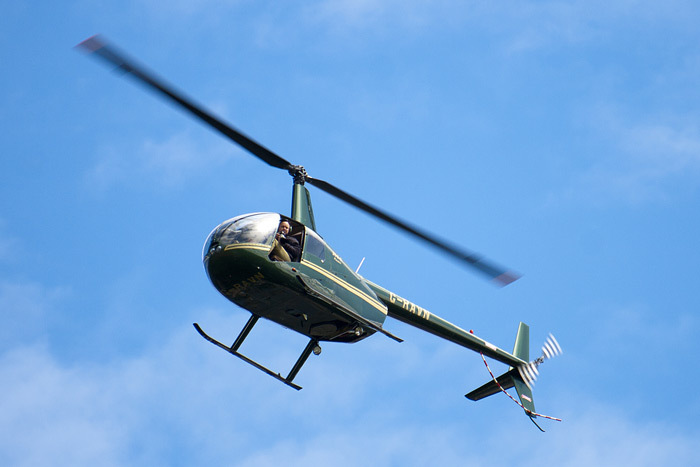 With over 150,000 spectators and over 200 aircraft participating in the flying and static displays. 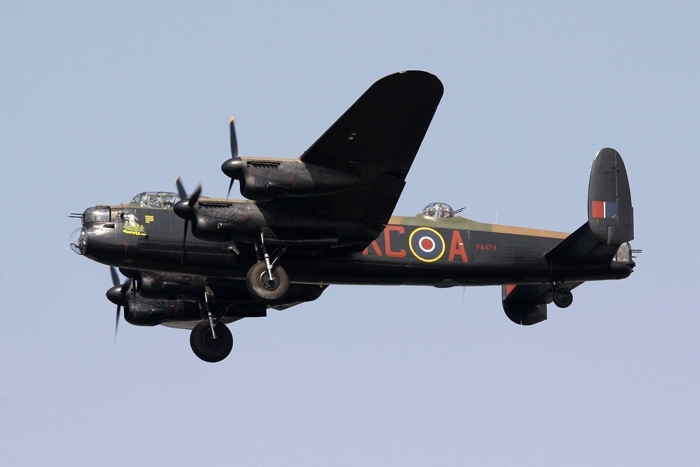 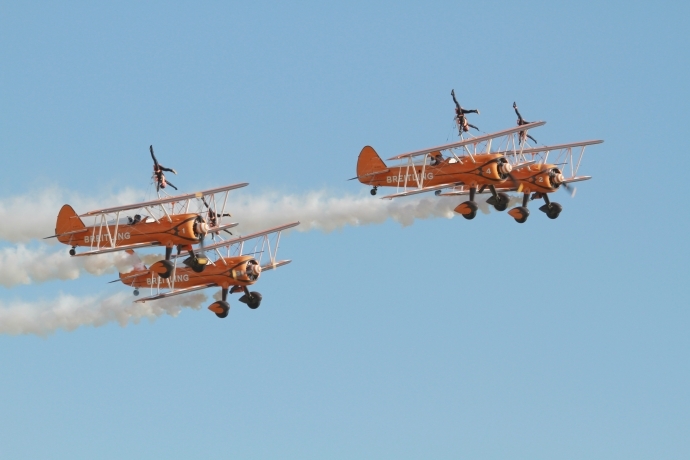 This year celebrated a wide variety of flight, from hot air balloons, vintage warbirds and gliders, through to some of the largest aircraft in the world and up-to-date fighters. 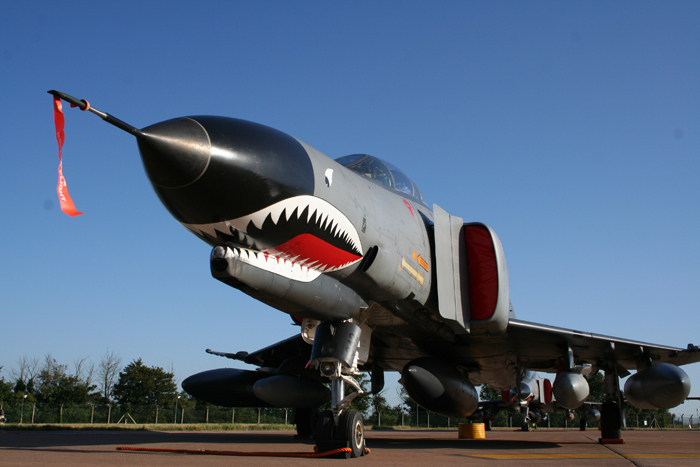 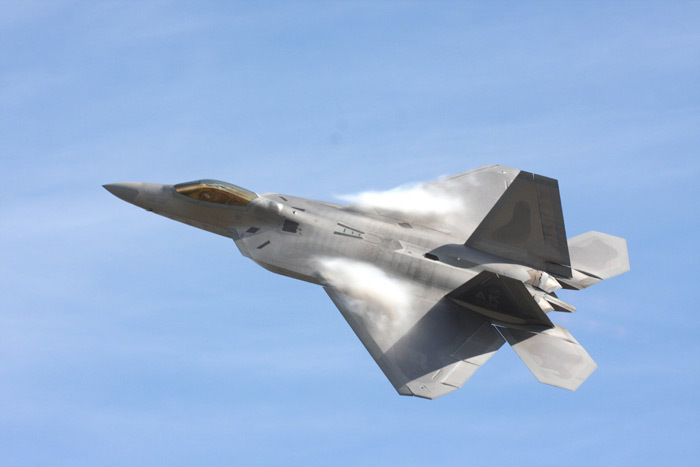 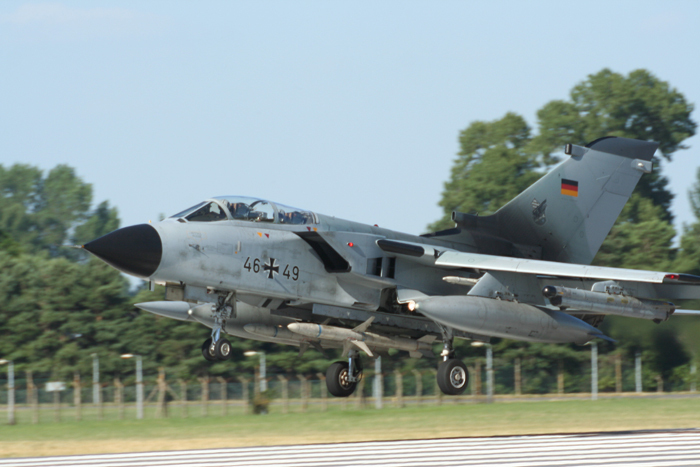 From large aircraft such as the B-52, the Vulcan and the new Airbus A400M, through to the much sought after F-22 Raptor and even the venerable German F-4F Phantom. 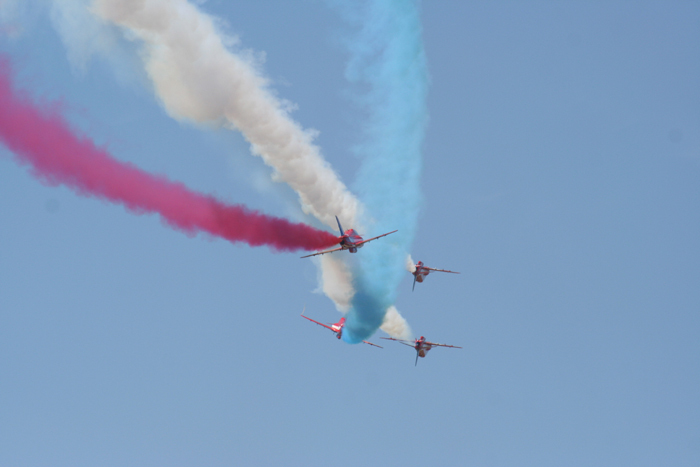 Display teams were represented by The Patrouille de France and our own Red Arrows. 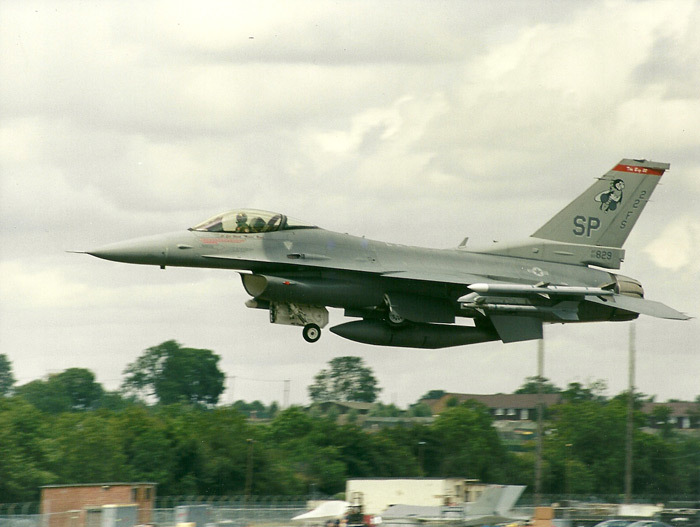 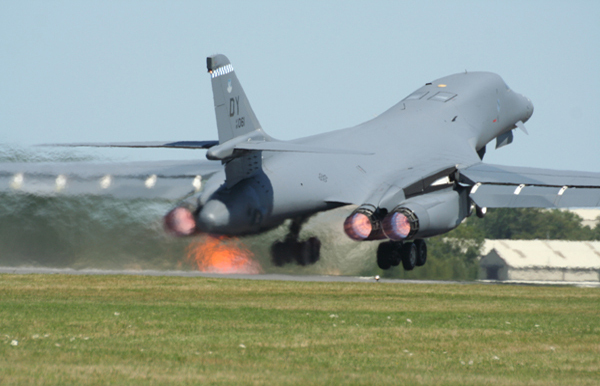 After the problems with the adverse weather conditions at Fairford in 2008, there were a lot of people holding their breath. 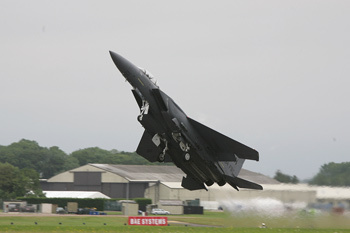 The weather was not ideal for the 2009 show, with at times low cloud base and rain showers. 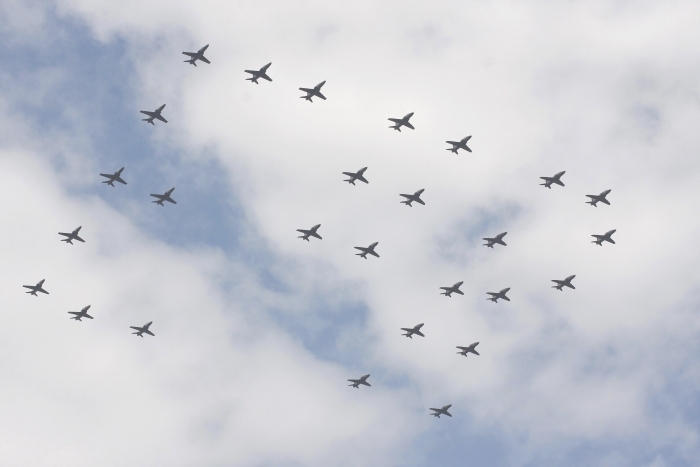 Thankfully it didn't repeat itself. 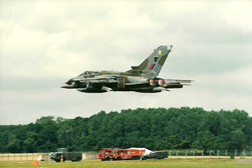 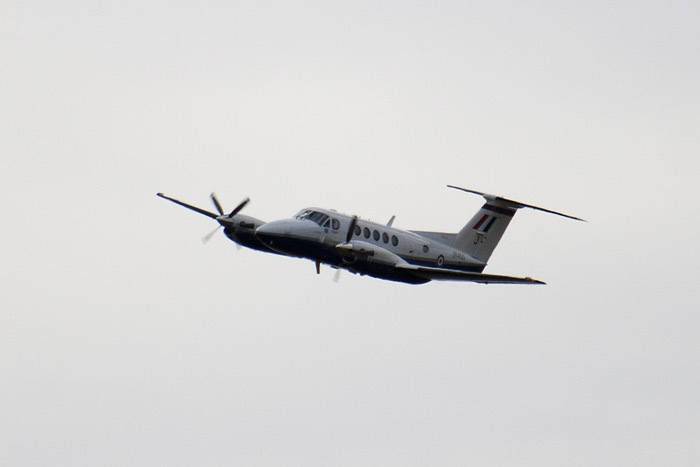 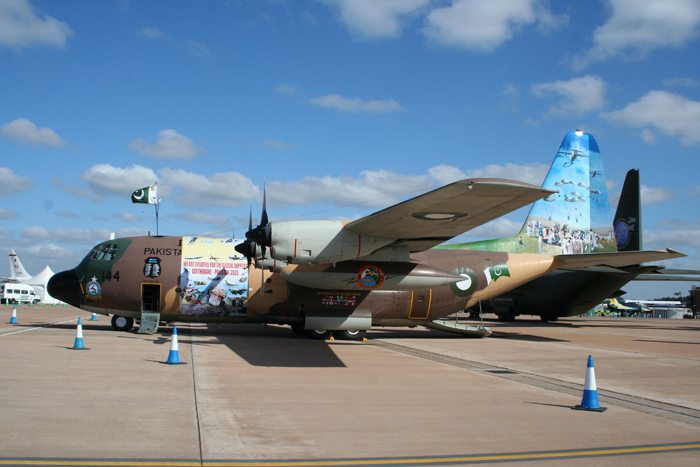 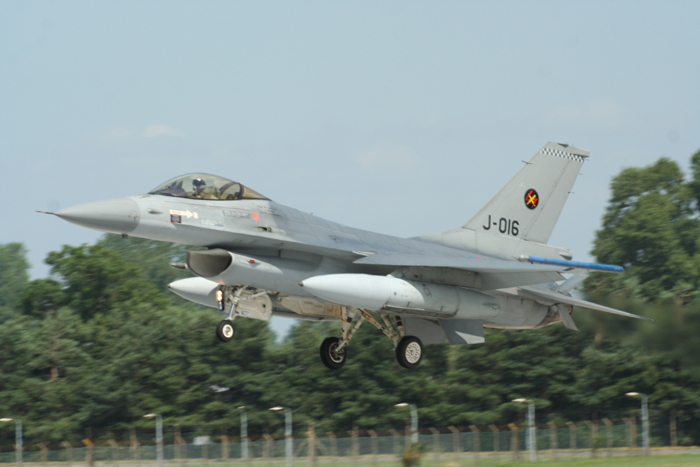 With 2009 seeing over 250 aircraft taking part from over twenty nations and over 150,000 visitors. 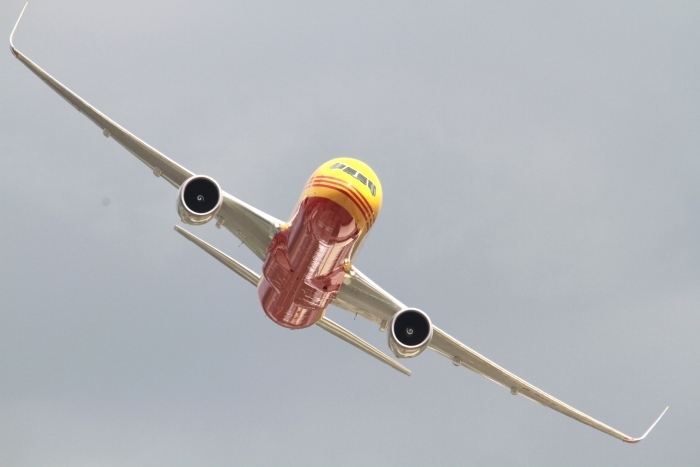 This is obviously down on previous years due to the world financial situation, availability and operational commitments of aircraft. 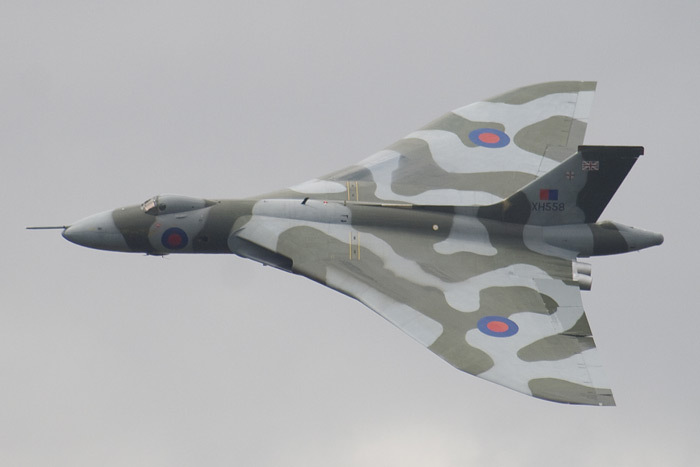 Two pieces of British engineering appearing at Fairford were the Avro Vulcan B2 XH558 and the BAE Systems Nimrod MRA4. 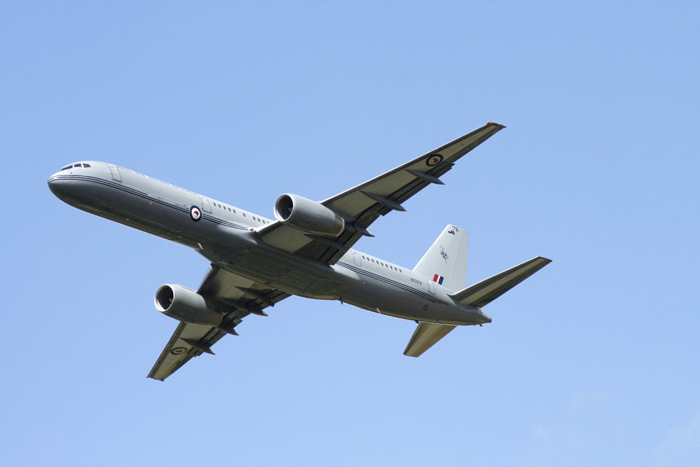 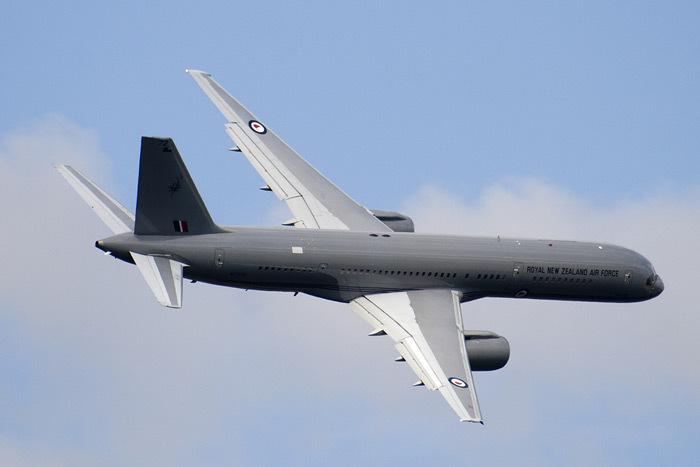 Another large aircraft was the Royal New Zealand Air Force Boeing 757. 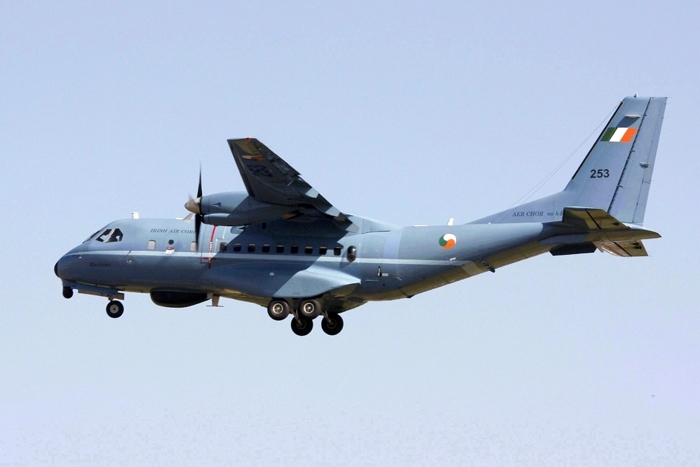 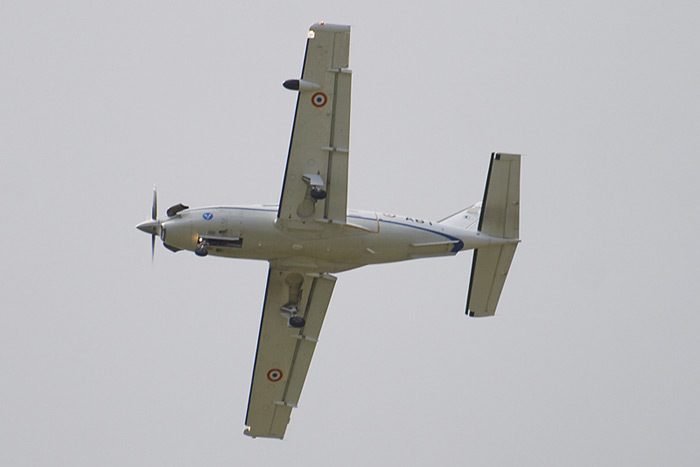 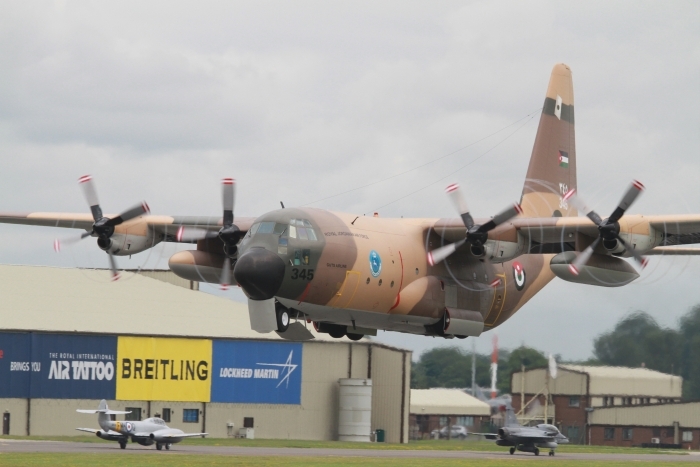 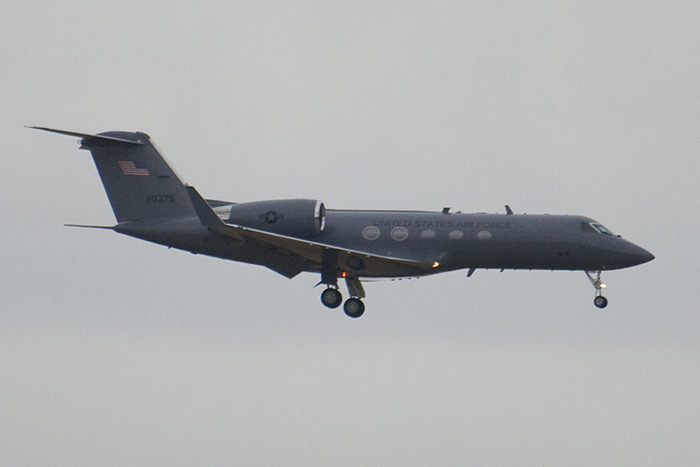 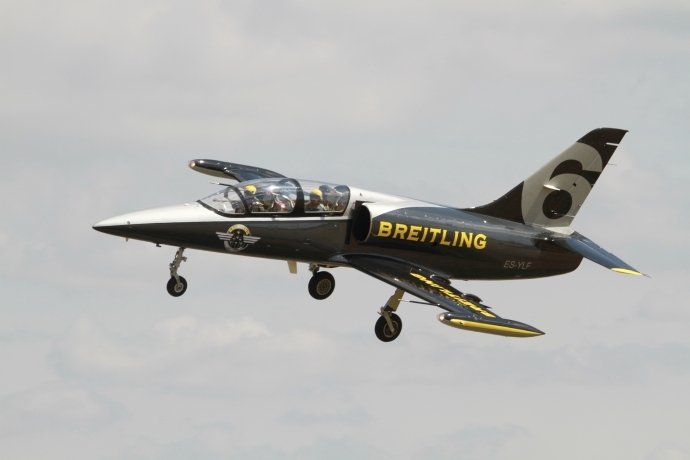 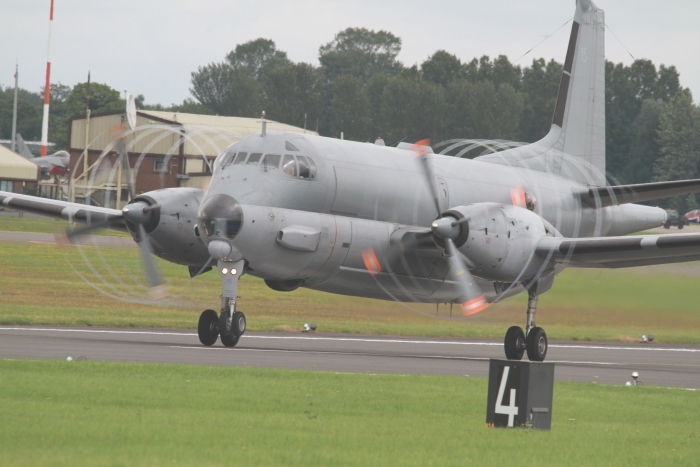 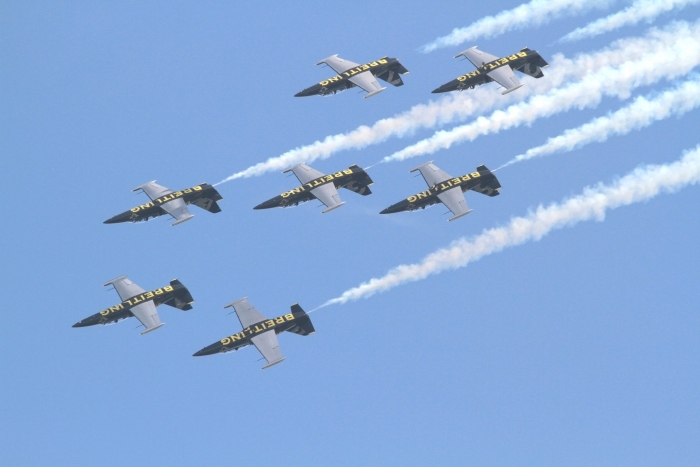 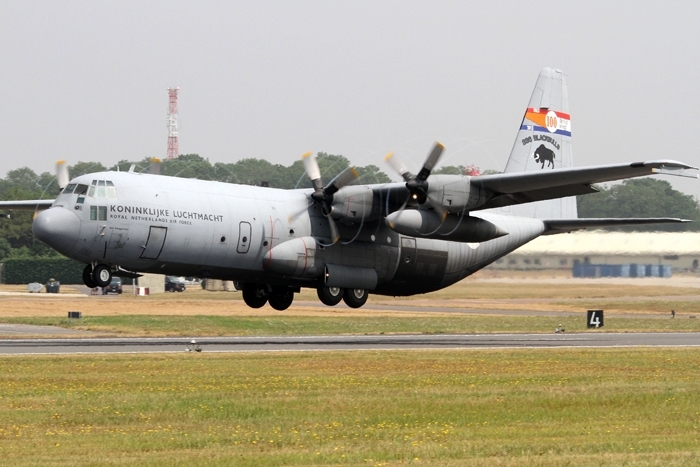 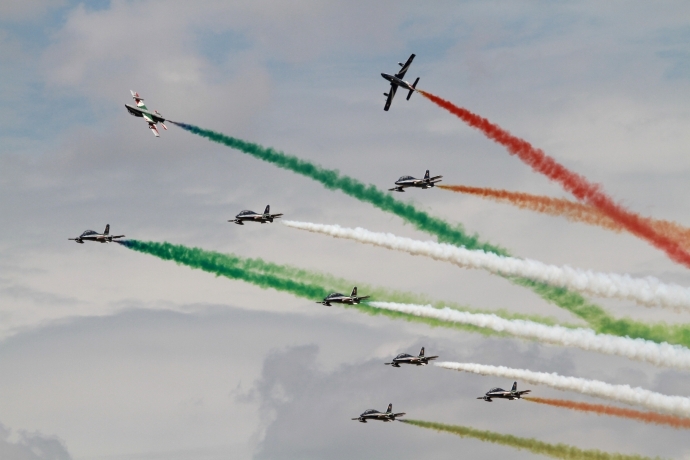 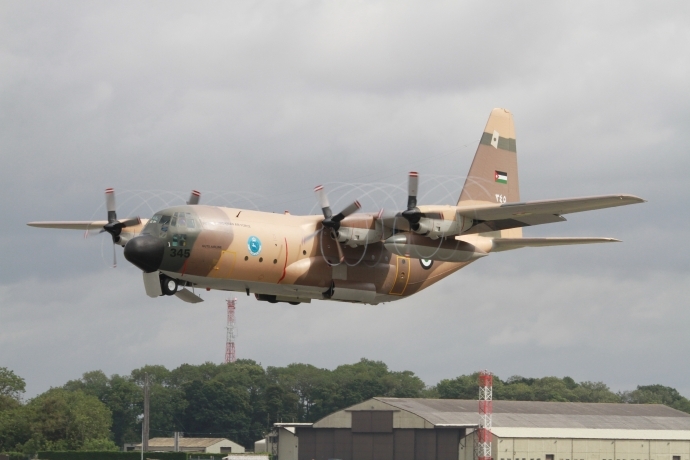 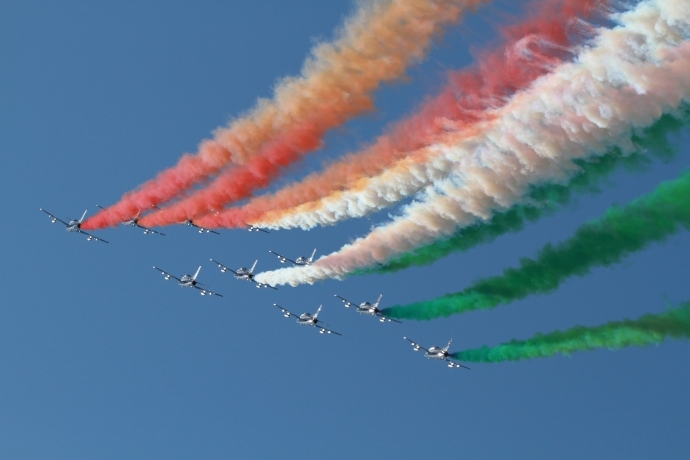 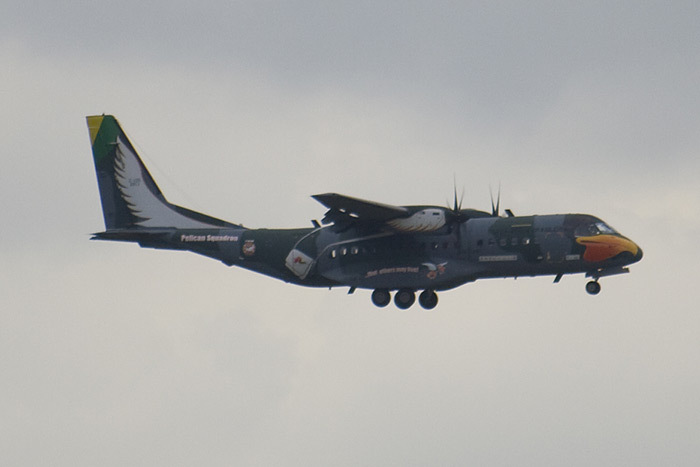 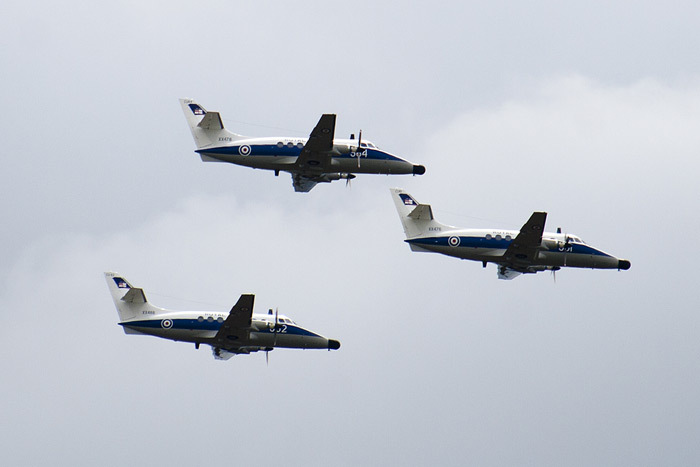 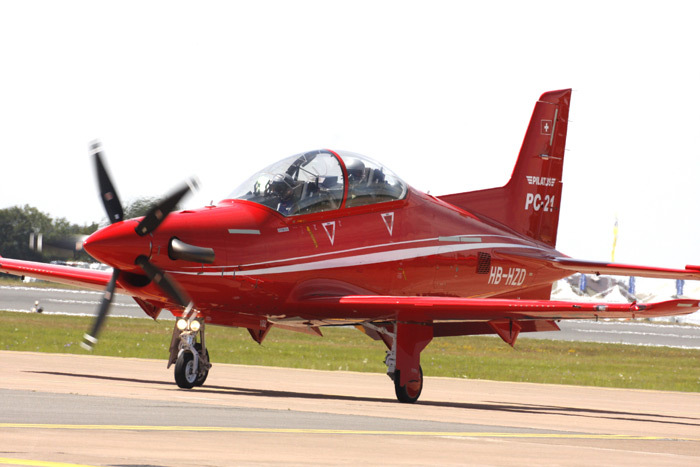 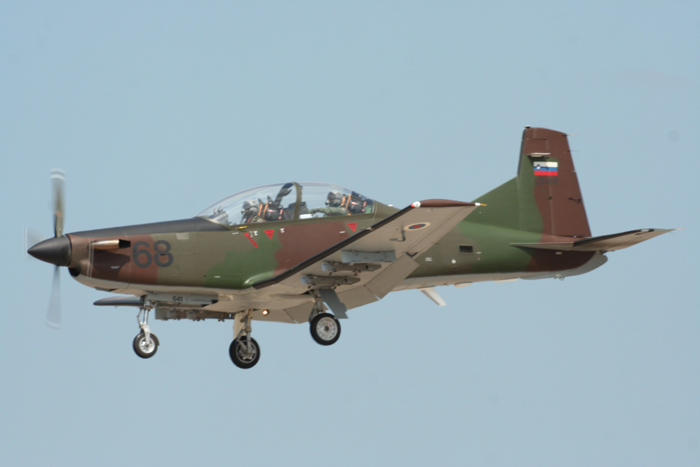 Other participating aircraft included an Italian Air Force C-27 Spartan, the Swiss Air Force PC-7 team, Breitling Jet Team, Royal Jordanian Falcons and The Frecce Tricolori. 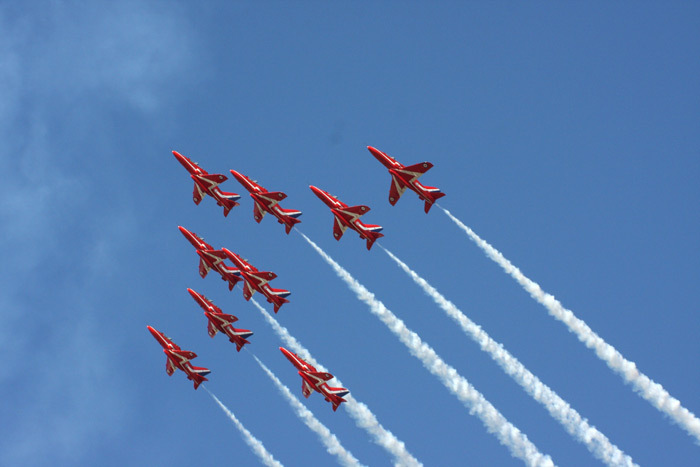 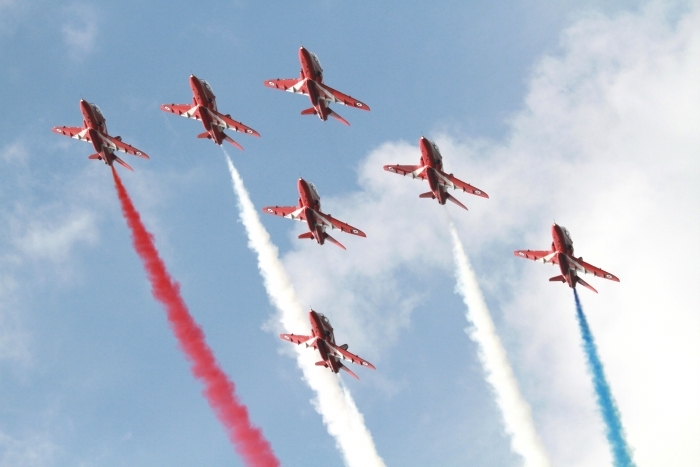 Fairford Air Show was chosen as the venue to celebrate the Royal Air Force's 90th anniversary, with Her Majesty the Queen presenting several units with new standards, with a planned flypast of ninety fixed and rotary winged aircraft. 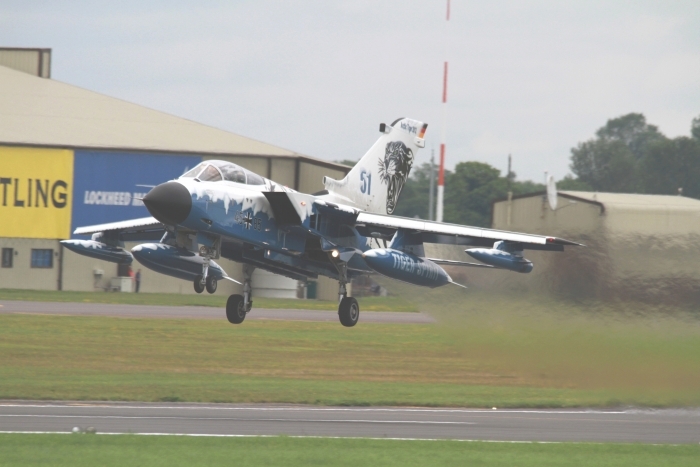 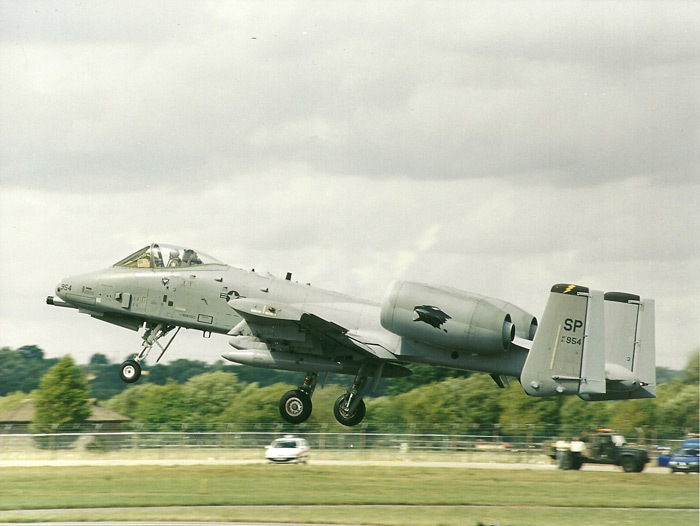 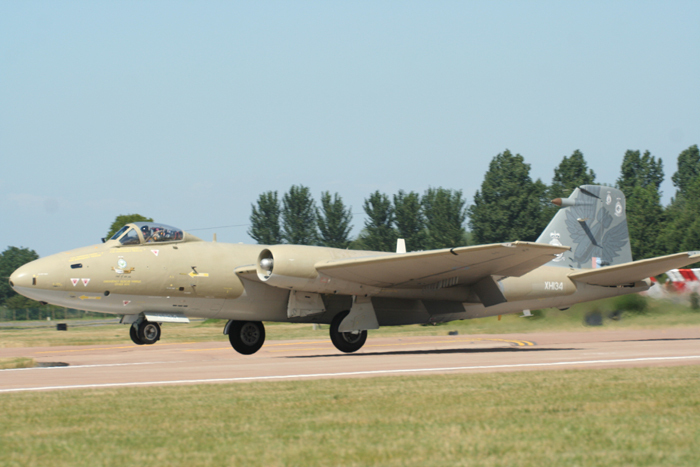 This event took place on Friday 11th July and the presentation was carried out just before lunch and immediately after Fairford was deluged with heavy storms. 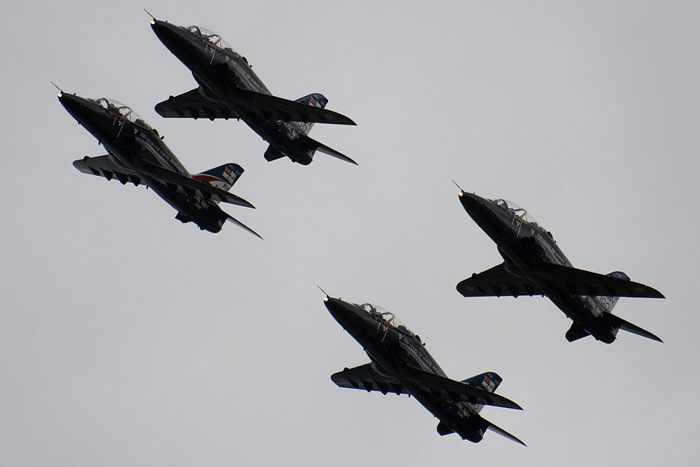 The flypast was due to begin at 14:30 and luckily there was a break in the weather, which enabled the flypast to go ahead. 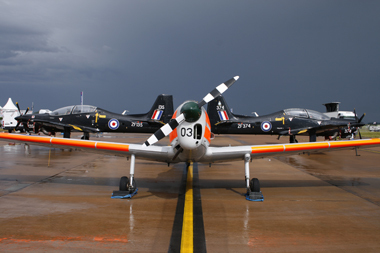 Unfortunately due to the heavy rain most of Fairford's car parks were flooded and the event had to be cancelled. 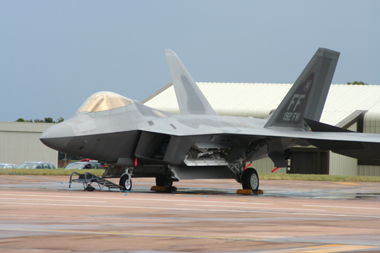 Fairford Air Show 2007 was once again a formidable show, with just about everyone that was involved in military aviation attending. 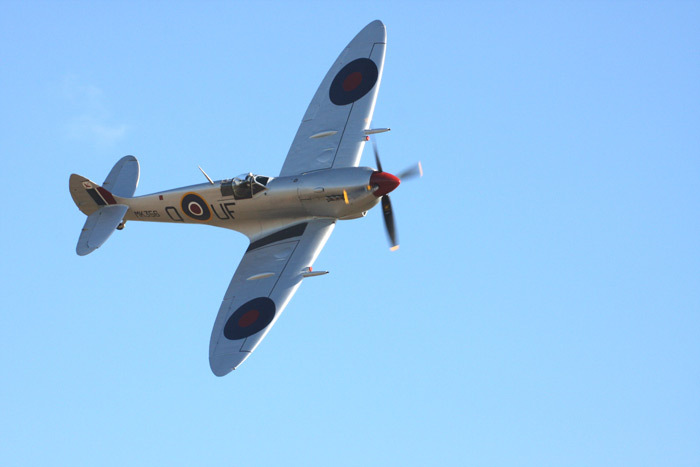 Once again the organisers pulled the rabbit out of the hat, with a mix and match of aircraft, making this a memorable weekend for the enthusiasts and the professionals alike. 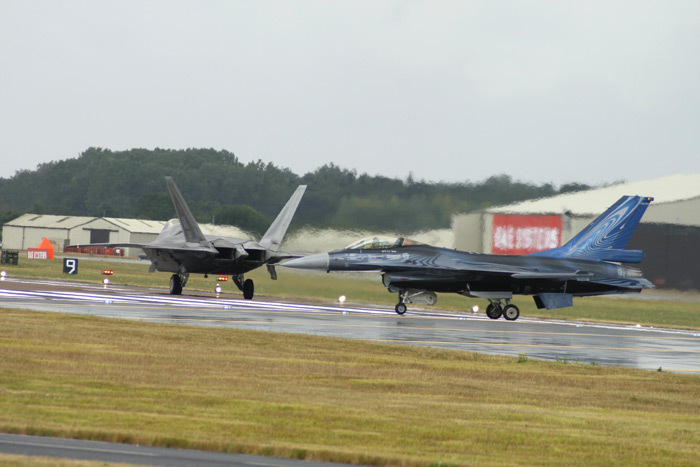 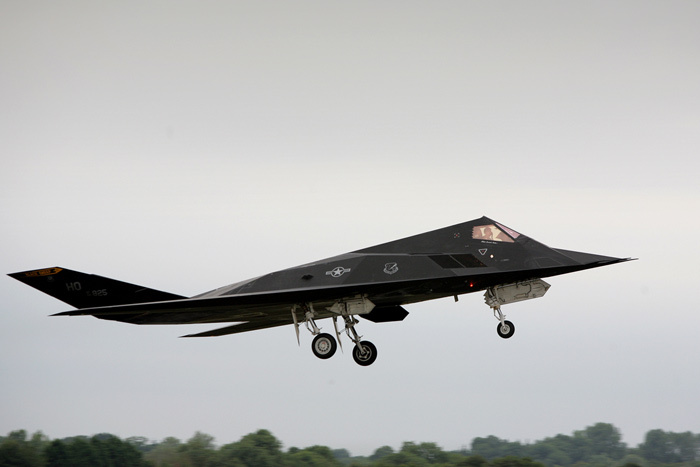 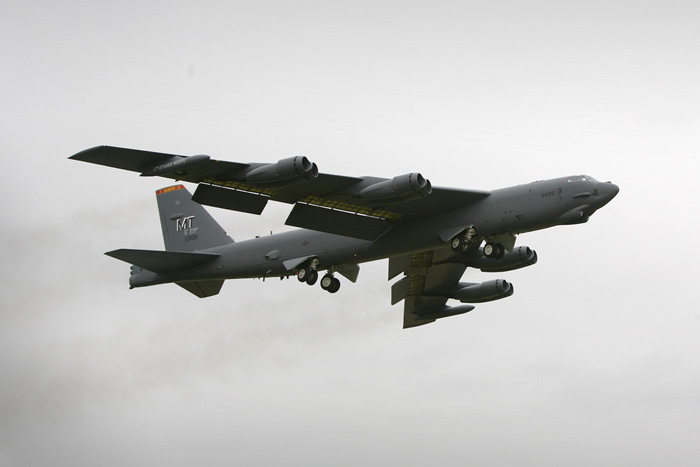 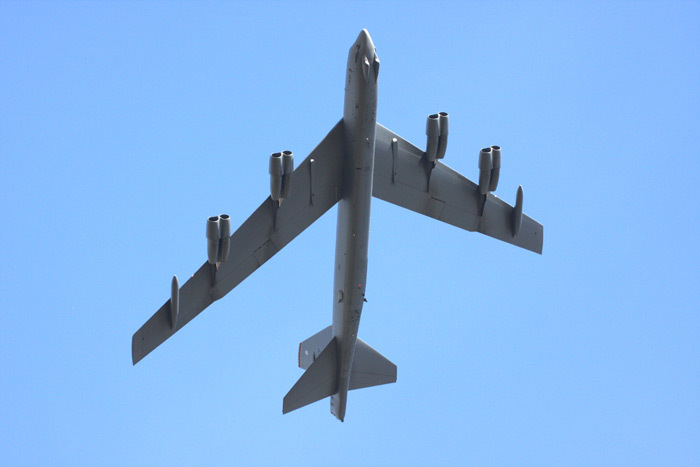 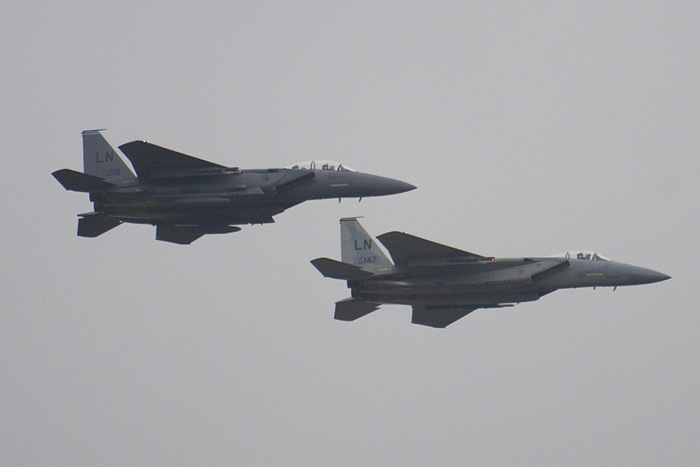 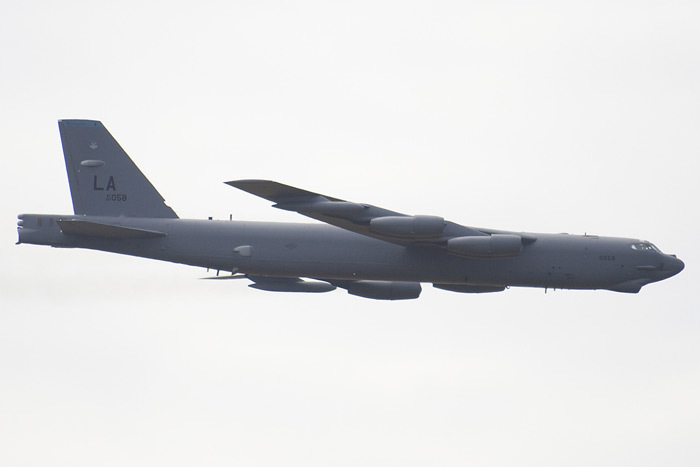 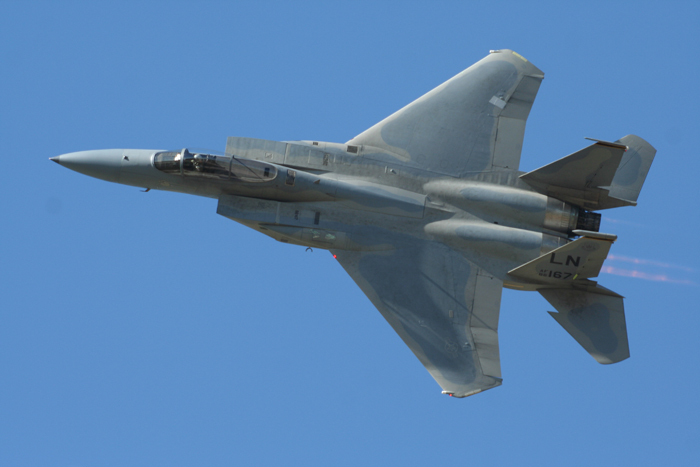 There was a significant number of American aircraft attending the show, including the B-52 Stratofortress, F-117A Nighthawk, B-1 Lancer and F-15 Eagle. 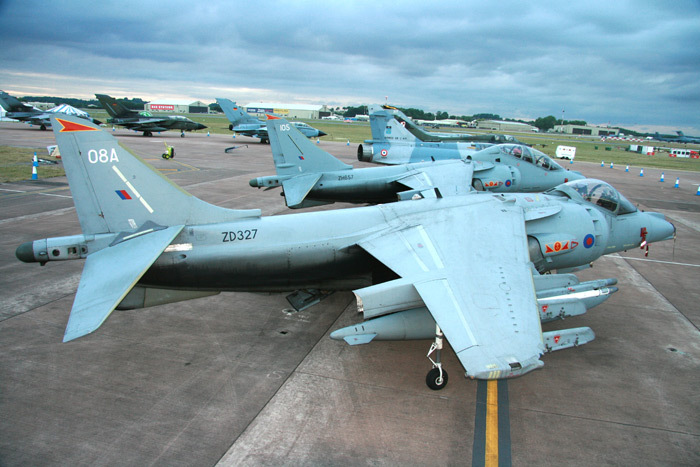 The RAF put on a role demo with the Boeing E3-D Sentry, a Chinook, C-130 Hercules, Tornado GR4s and F-3s and BAE Hawks. 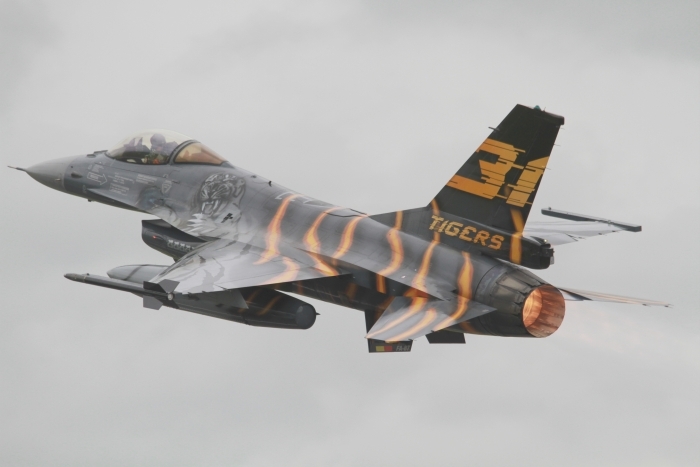 With the pyrotechnics really bringing this display to life. 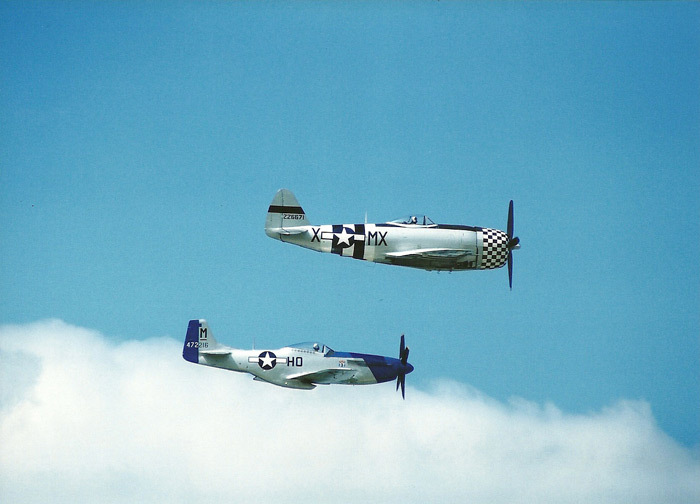 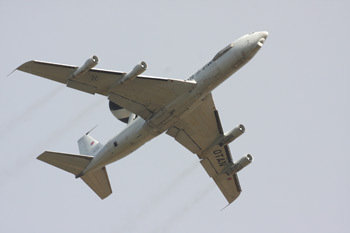 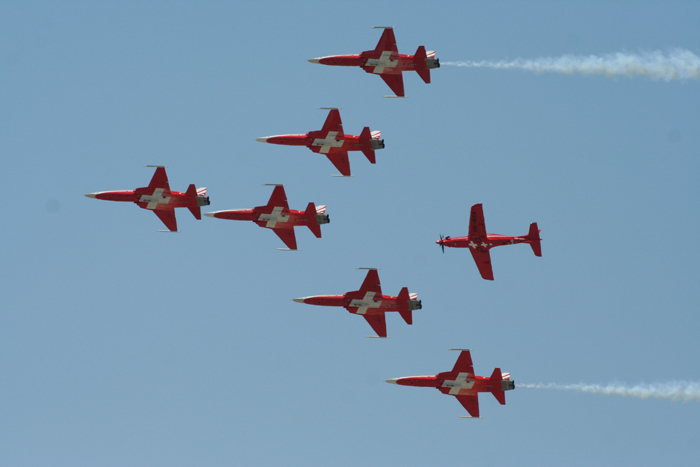 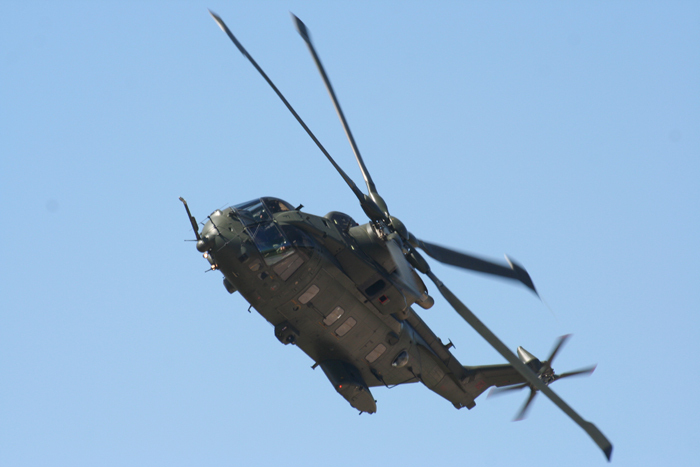 This year's air show was on the 15th & 16th July, with fantastic weather conditions for both days. 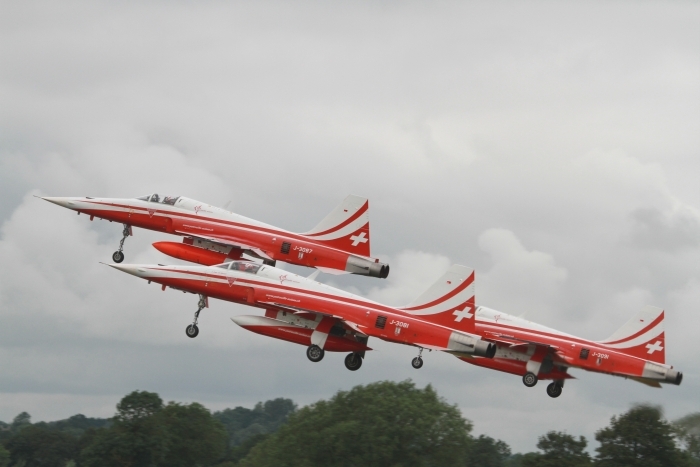 The show was well organised by the Fairford team as usual. 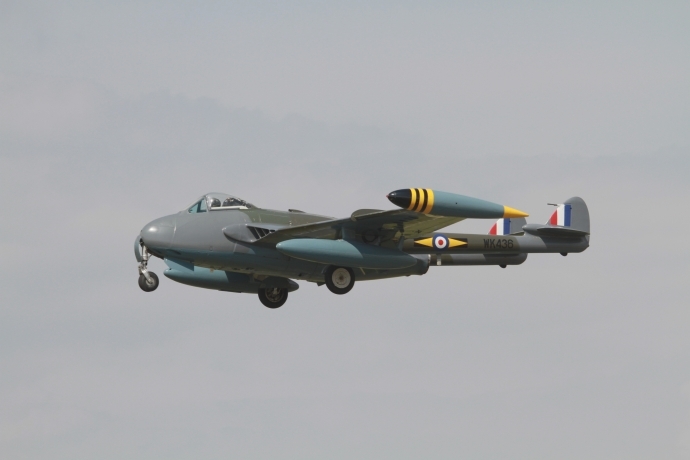 With a variety of static and flying aircraft, of note was the PR9 Canberra from RAF Marham, in its last year of service, being put through its paces by Squadron Leader Terry Cairns. 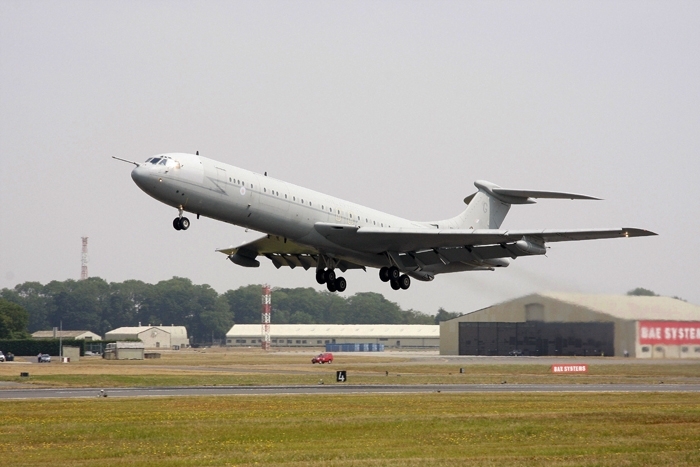 Also the anniversary VC10 from 101 Squadron, another classic aircraft coming to the end of its life. 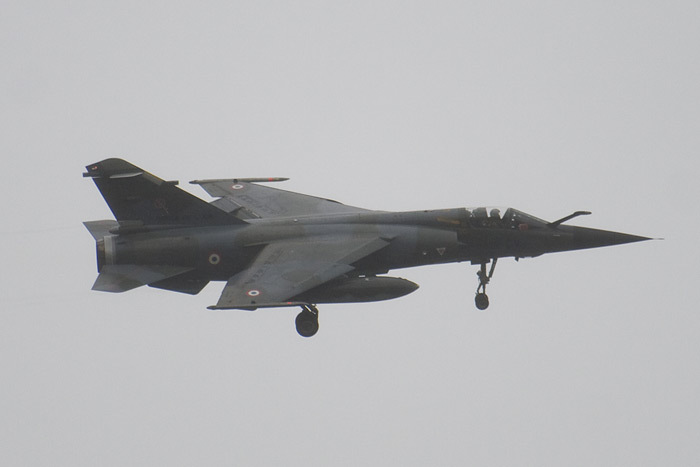 As usual there were aircraft from around the world, including participants from Russia, France, Pakistan, Greece and America.